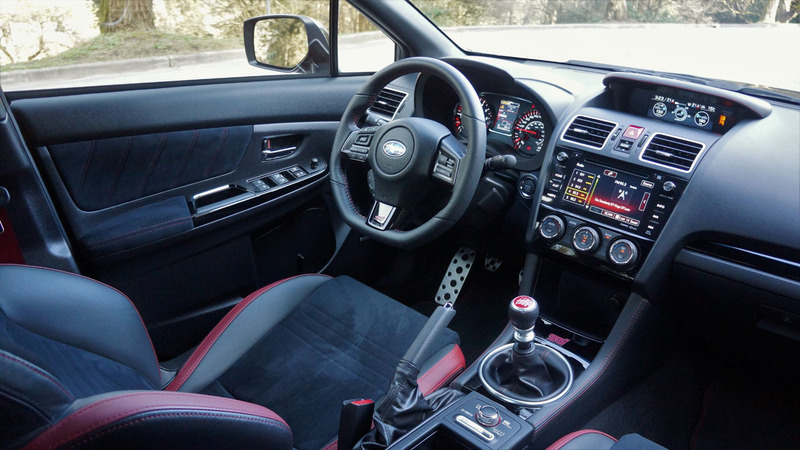 The world rally-inspired sedans received a ground-up redesign for 2015, featuring much more distinctive bodywork all-round including unique bumpers, fenders, aero, and trim details when compared to its Impreza sedan donor model, plus a new, more potent direct-injected 2.0-litre turbo-four replacing the aged sequential multiport injected 2.5 in the regular WRX, this new engine adding three horsepower and 14 more lb-ft of torque resulting in 268 horsepower and 258 lb-ft, a six-speed manual in place of that model’s old five-speed, and the option of a sport-tuned continuously variable transmission (CVT) with paddles where no automatic was ever offered before. 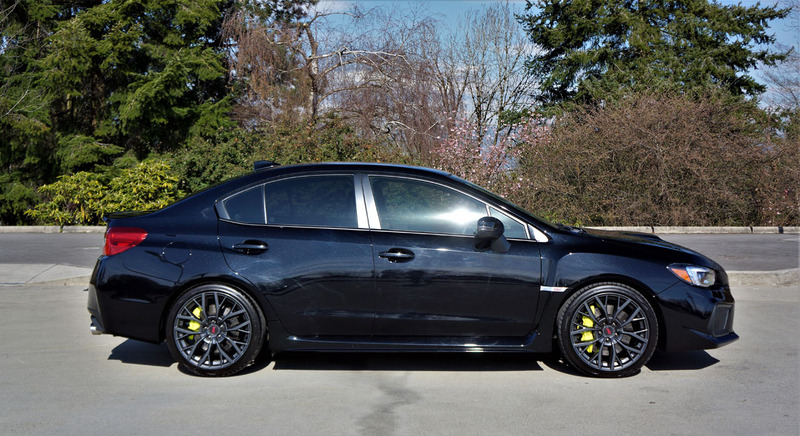 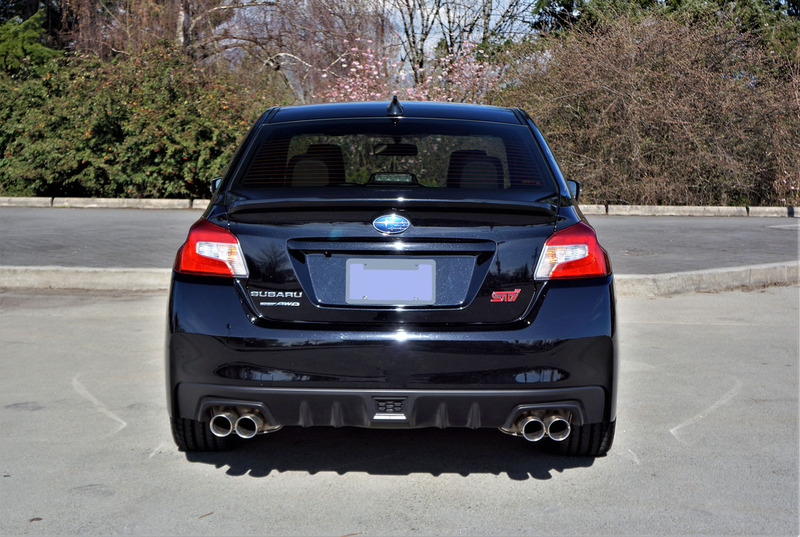 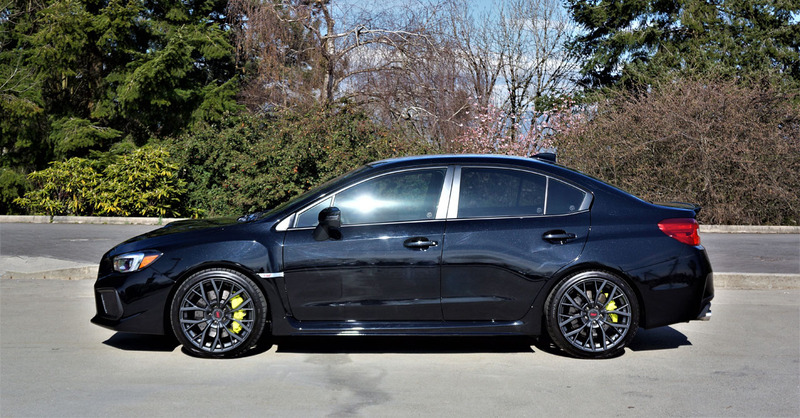 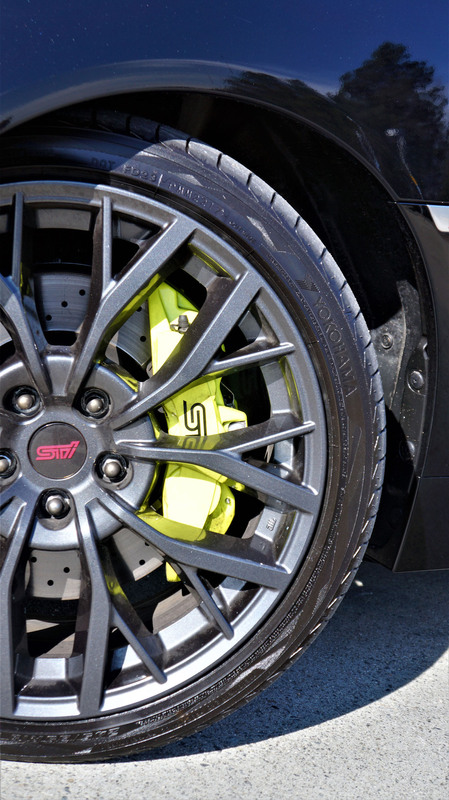 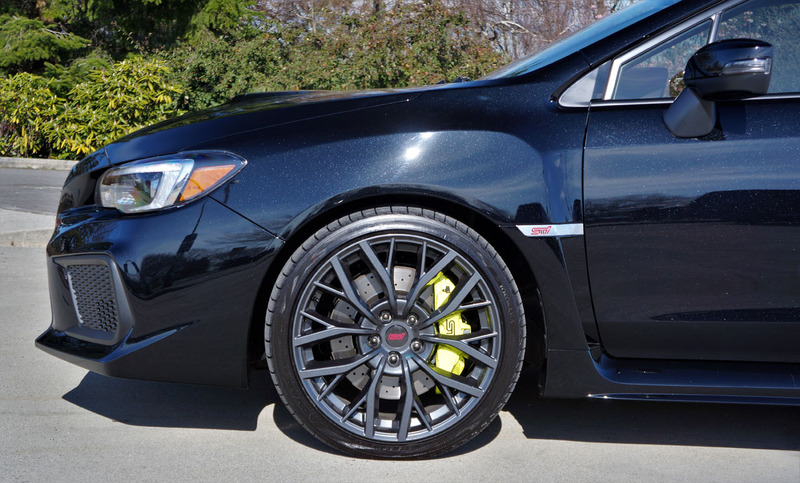 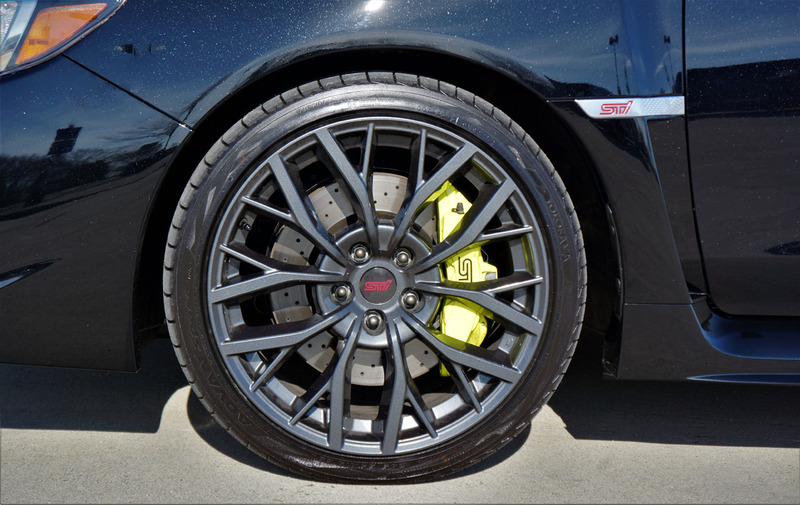 The STI continued forward with its 2.5-litre turbocharged flat four making 305 horsepower and 290 lb-ft of torque. 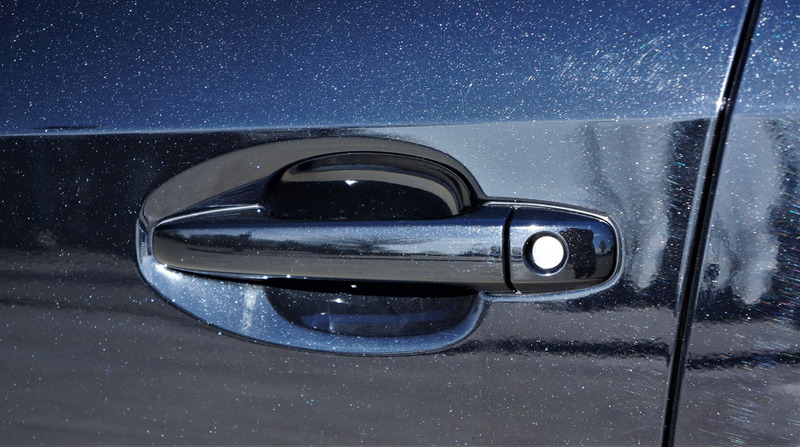 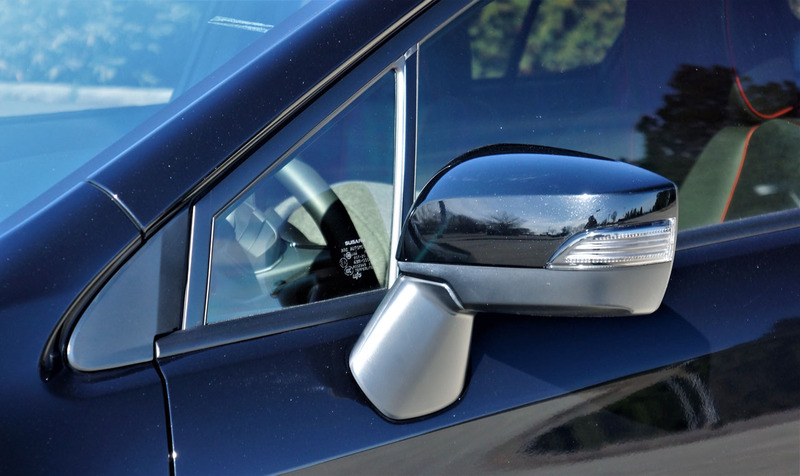 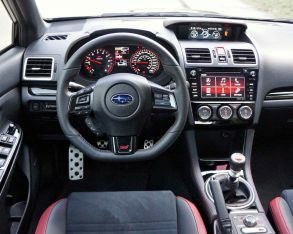 Model year 2016 added one-touch turn signals, revised steering wheel controls, and a standard 6.2-inch touchscreen with StarLink smartphone integration, plus the Hyper Blue-painted STI Hikari limited edition; 2017 added automatic reverse-tilt to the passenger’s side power mirror, a more premium-like woven fabric headliner, and improved the six-speed manual transmission’s feel, while Sport-tech trims also received Siri Eyes-Free, Mirror Link, Travel Link and SiriusXM Traffic integration; and now for 2018 this dynamic duo get a few styling updates, some chassis mods, a bevy of additional refinements, as well as new safety features, while the STI gets one redesigned drivetrain component. 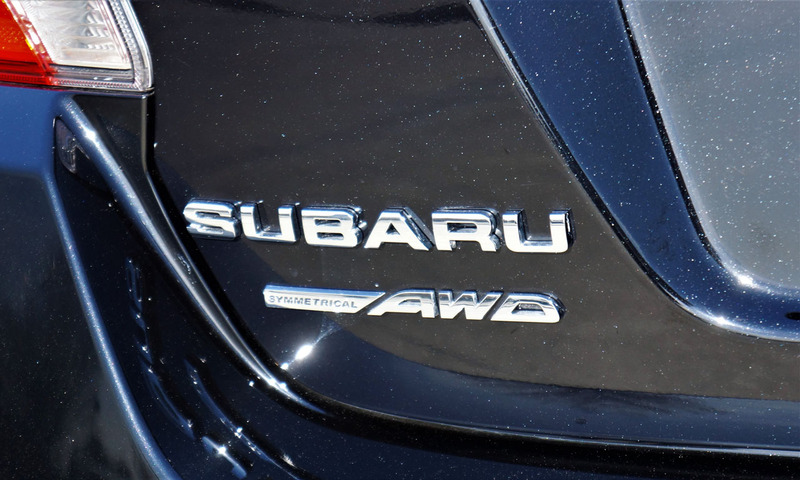 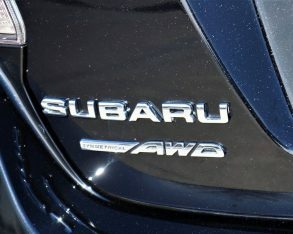 Subaru has made changes to the 2019 version too, but I’ll leave those until later. 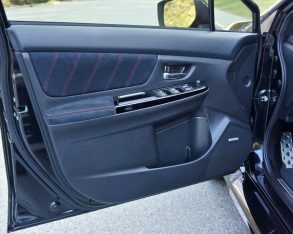 The 2018 styling updates affect both models and include a new front grille and bumper design and reworked interior door trim, while other updates include a new primary gauge cluster with a 5.9-inch colour multi-information display (MID), a fold-down rear centre armrest with integrated cupholders, reduced interior noise, new suspension tuning, and bigger batteries. 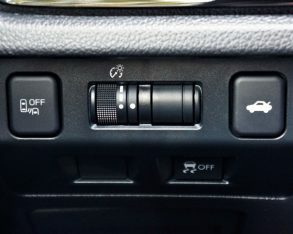 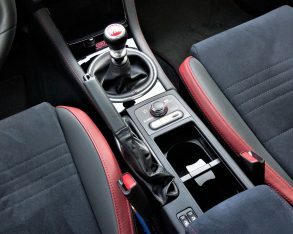 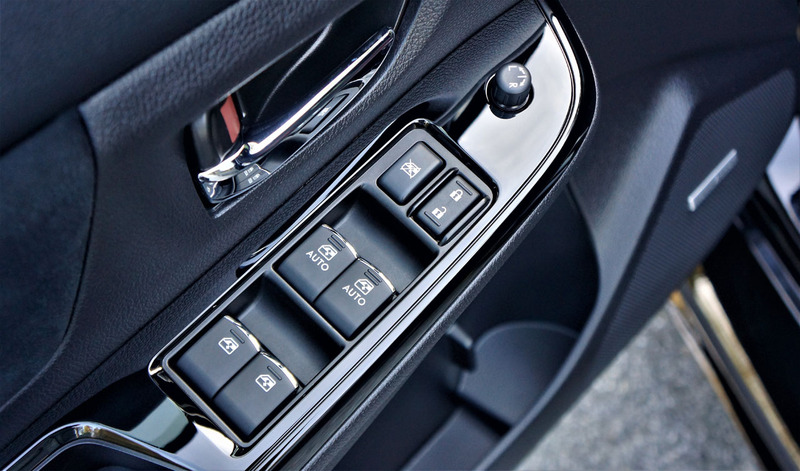 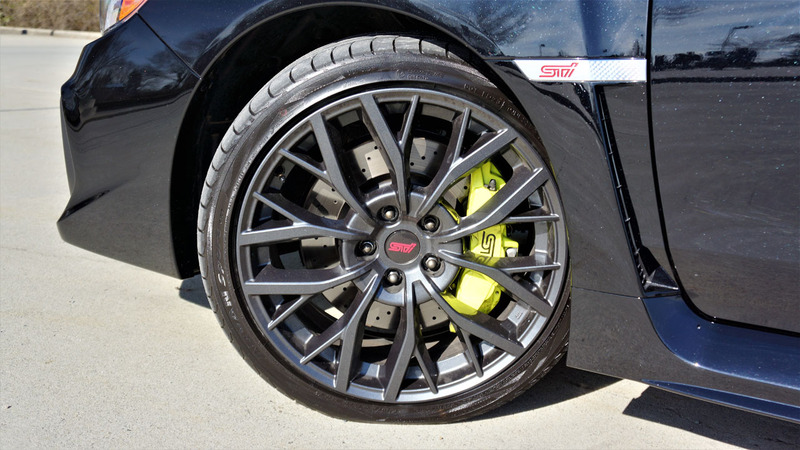 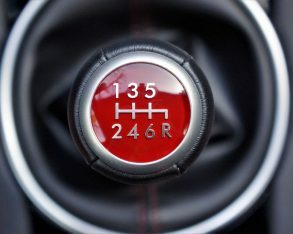 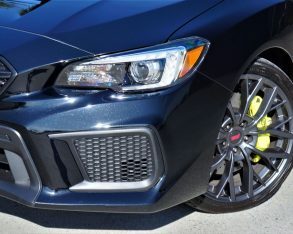 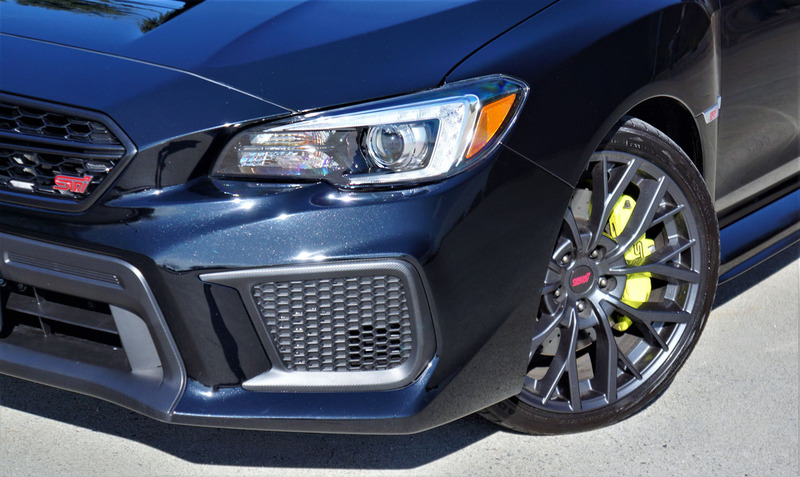 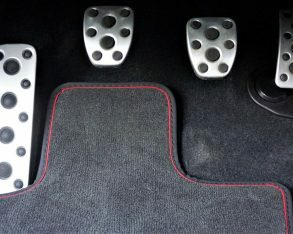 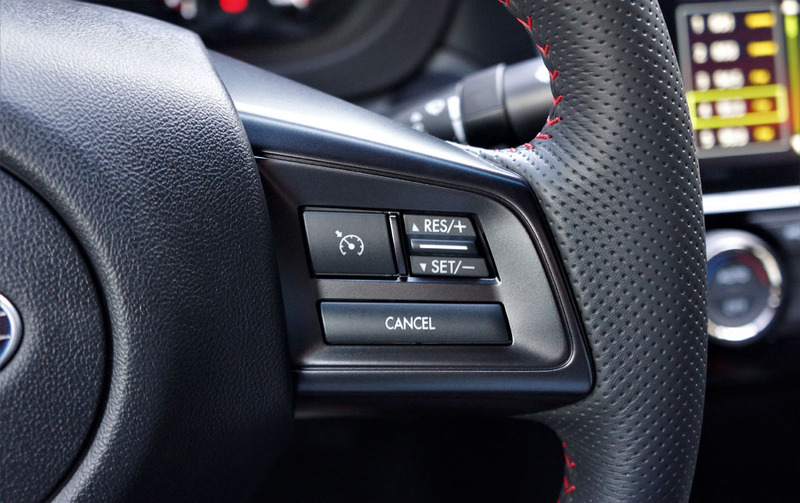 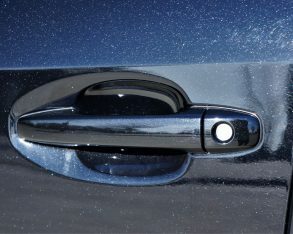 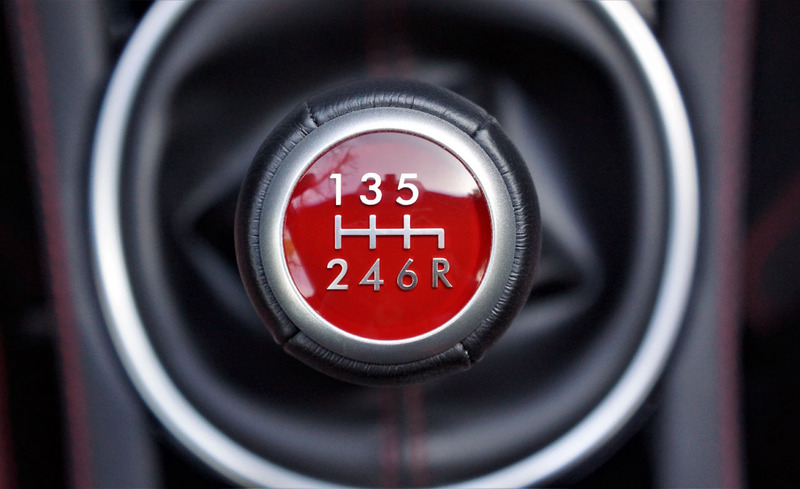 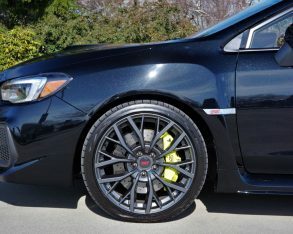 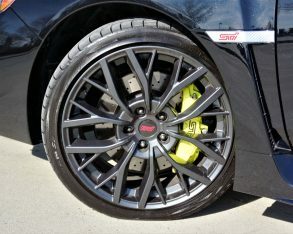 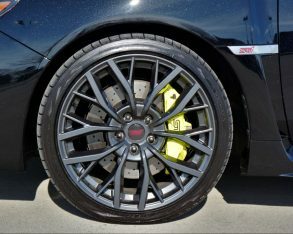 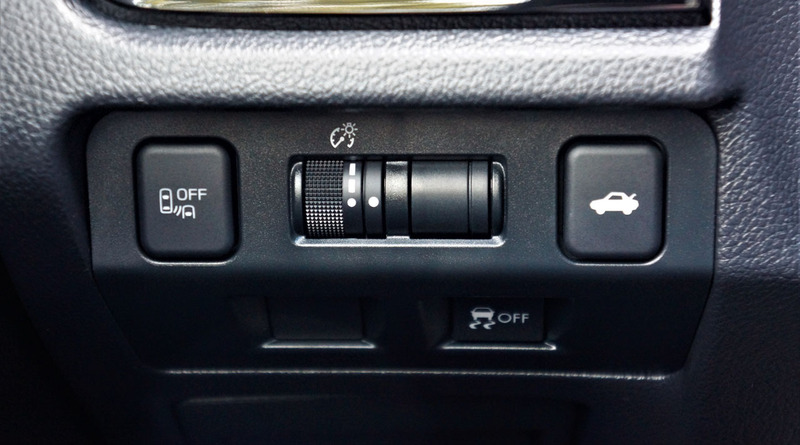 Specific to the base WRX, manual models get a new shift lever and yet better shift and clutch take-up feel, plus improved steering feel, whereas the STI now includes standard LED headlights, standard cross-drilled Brembo brakes that are 24 mm larger and 6 mm thicker up front than those on the regular WRX, at 340 by 30 mm, plus 40 mm larger and twice as thick in back at 326 by 20 mm, with six-piston front calipers (two more than the previous STI and four more than the regular WRX) and two-piston rear calipers (double what the WRX offers) plus four-channel, four-sensor and g-load sensor equipped Super Sport ABS, a revised Driver’s Control Centre Differential (DCCD) system that’s no longer hybrid mechanical with electronic centre limited-slip differential control, but rather an electric design that provides quicker, smoother operation, while inside it gets red seatbelts. 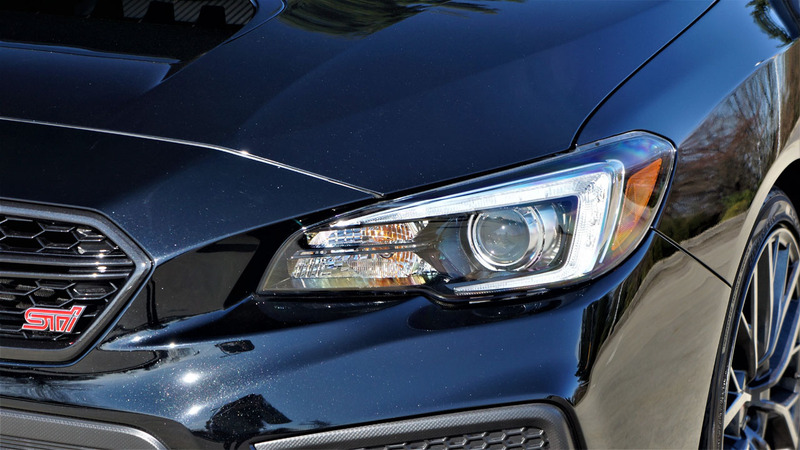 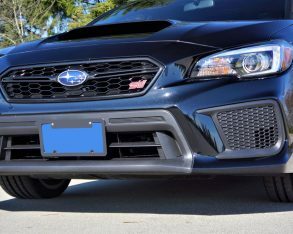 As for new 2018 options, Sport trim with the base WRX is updated to include steering-responsive LED headlights, LED fog lights, and a 10-way powered driver’s seat, while the Sport-tech package adds new StarLink connectivity apps including Yelp, Best Parking and Glympse. 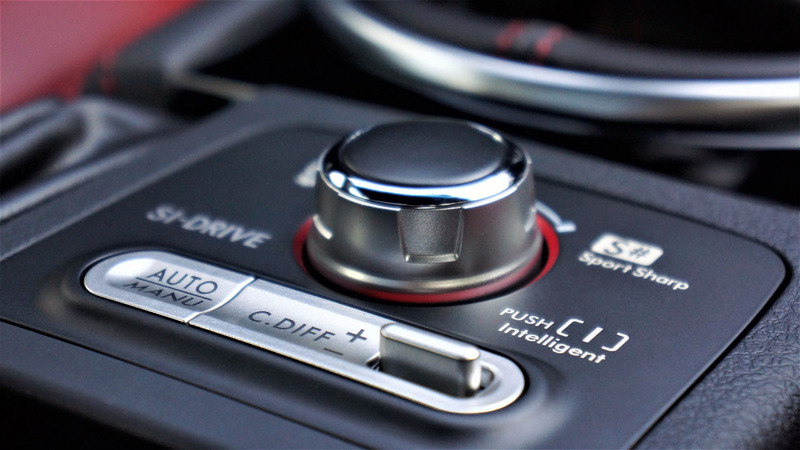 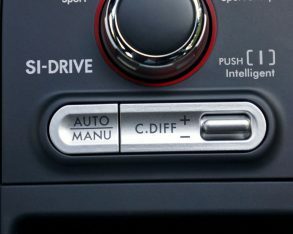 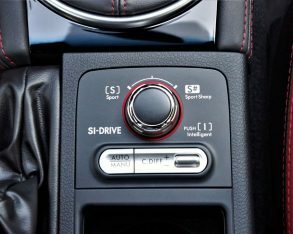 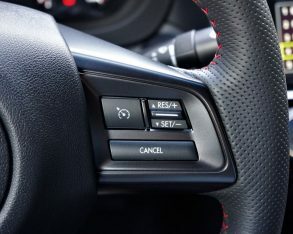 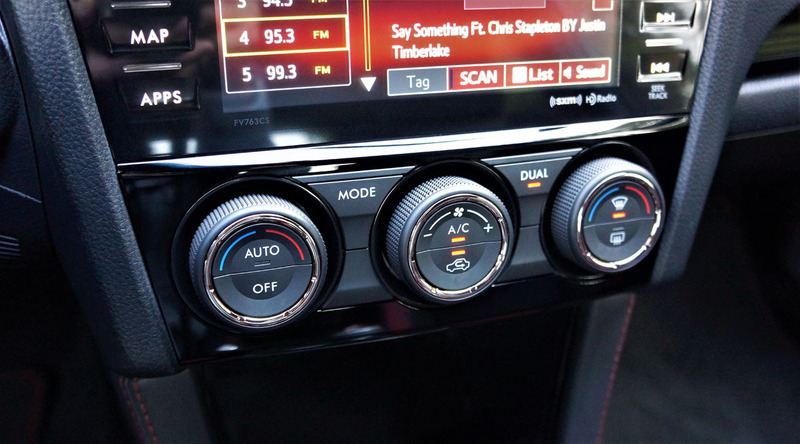 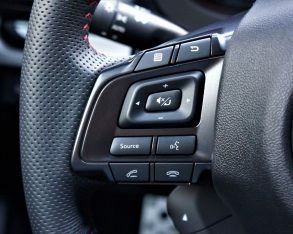 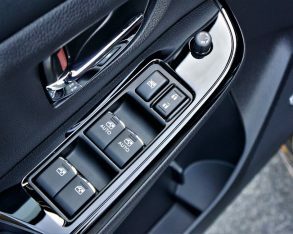 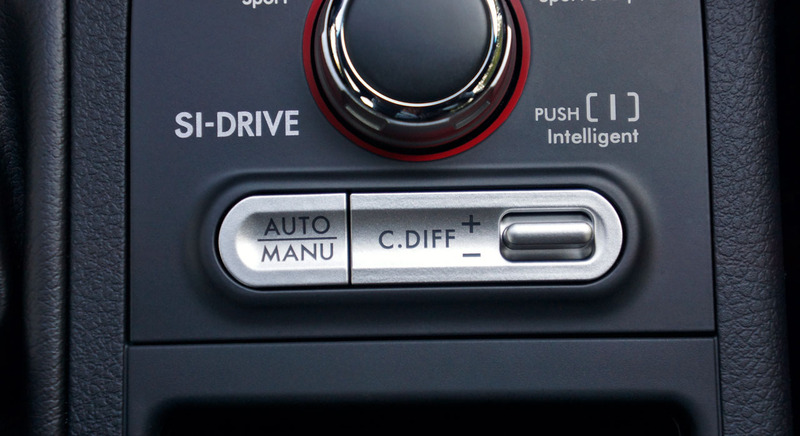 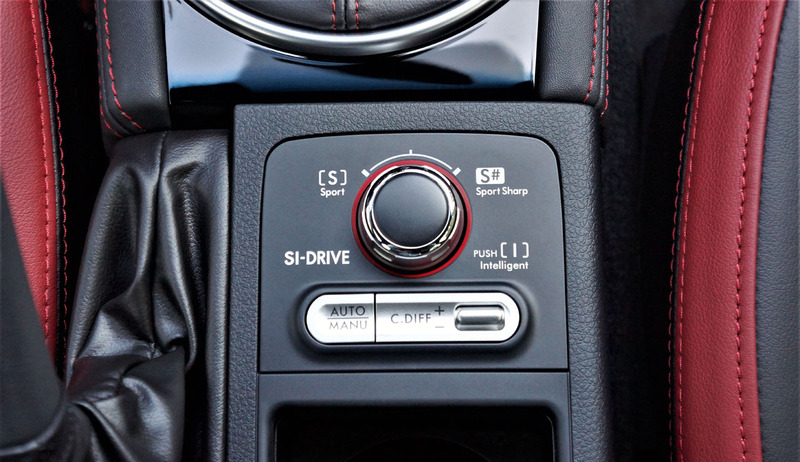 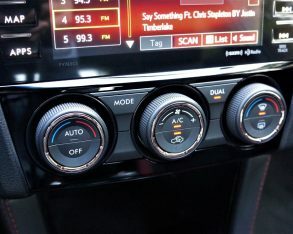 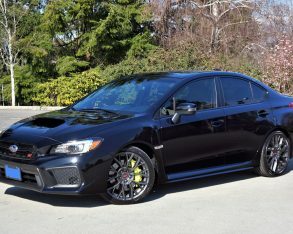 Additionally, Sport-tech models with the manual now get the option of an RS package featuring eight-way powered front seats, leather and ultrasuede upholstery, uprated brake pads, and red calipers, while Sport-tech cars with the Sport Lineartronic CVT become the first WRX models to ever include Subaru’s EyeSight suite of advanced driver assistance systems. 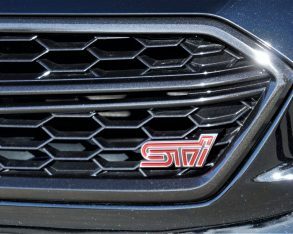 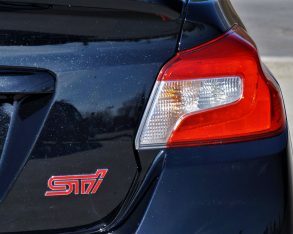 As for the STI, an upgrade to Sport trim now adds 19-inch wheels, wiper-activated automatic headlights, and a 10-way powered driver’s seat, while the fog lamps were deleted to allow for larger air intakes. 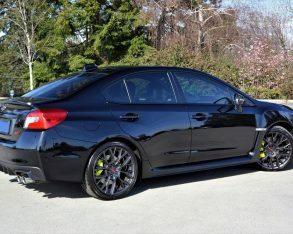 Additionally, STI models upgraded with the Sport-tech package can be had with either a massive rear wing or much smaller lip spoiler, the latter more appealing to those who don’t want to draw as much attention from passersby, while a set of Recaro sport seats are added in both leather and ultrasuede upholstery, with the driver’s receiving eight-way powered adjustment. 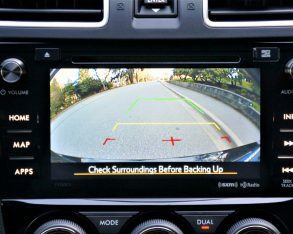 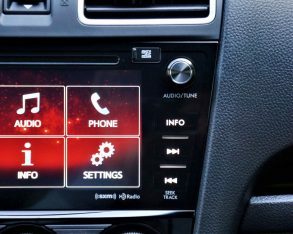 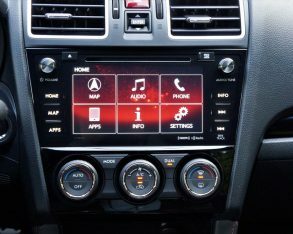 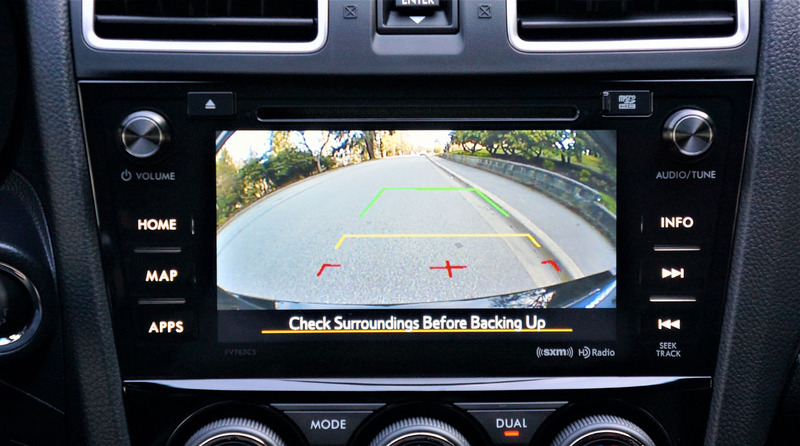 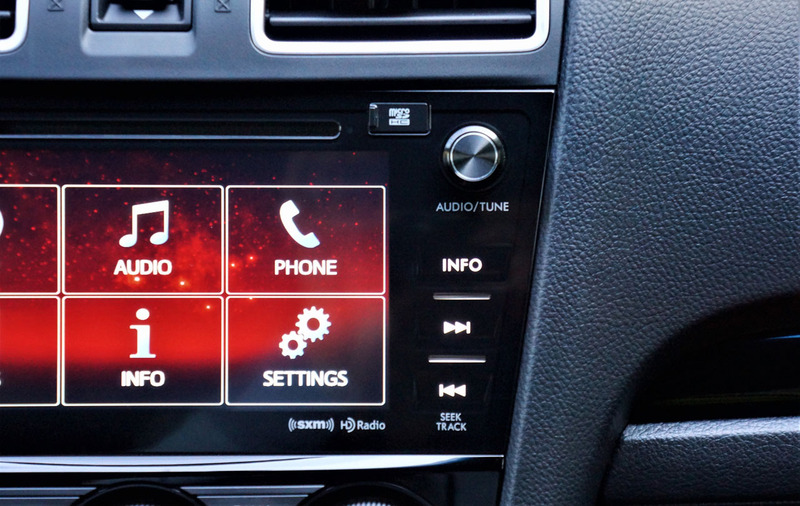 Subaru also includes the aforementioned StarLink apps with the Sport-tech upgrade. 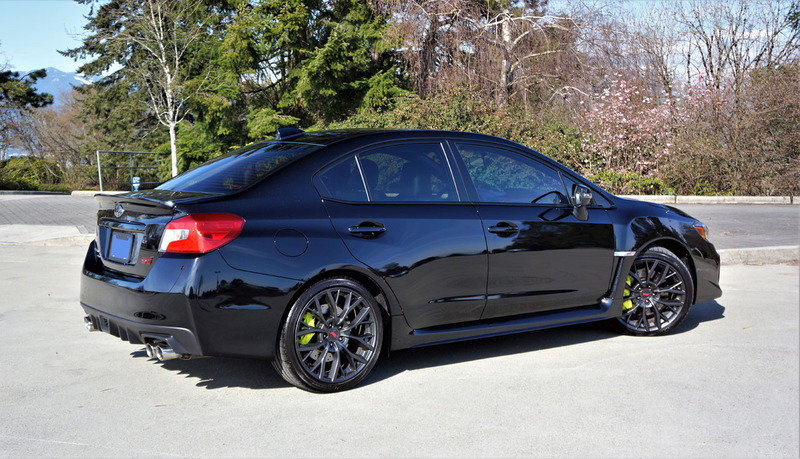 Like I said, Subaru doesn’t exactly remain idle with the WRX and STI, despite its relative niche model status. 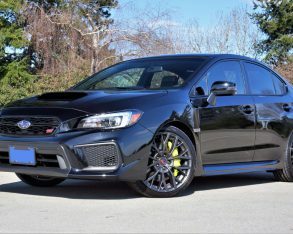 Added to this, the 4,616 examples sold into Canada last year, and the 2,308 delivered up to the close of Q2 2018 (which bizarrely is precisely half of the entire 2017 total number despite having zero months with the same figure—Subaru only totaled 2,303 WRX/STI sales at the halfway mark of 2017), made up a significant 8.5 percent of Subaru’s total volume in 2017 and 8.3 percent so far this year, not to mention a third of the Japanese brand’s overall Impreza sales over the same six months if you combine the two models’ Q2 figures (Subaru sold almost half as many WRX/STI models as Imprezas over the first half of 2018). 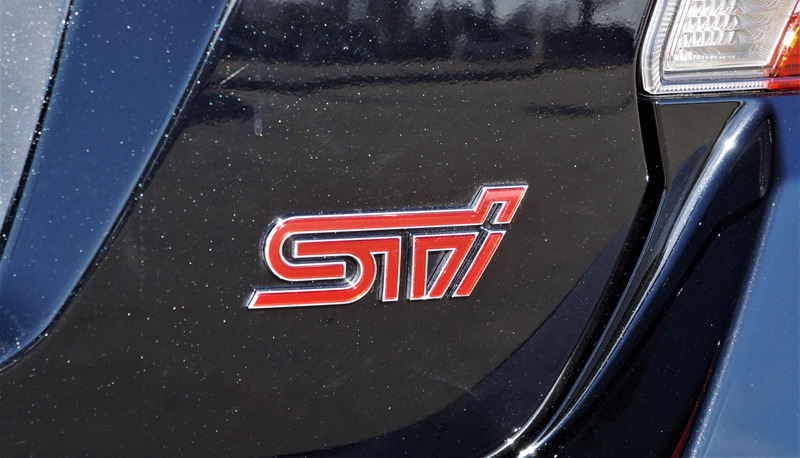 What’s more, the WRX/STI earned more than twice as many invested fans than VW’s GTI/Golf R combo. 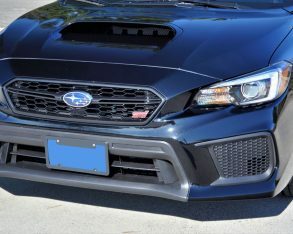 So much for being a niche model. 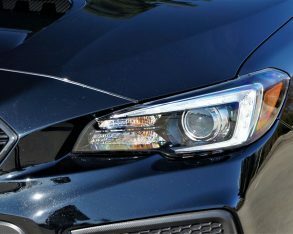 I like the styling updates, as they give the front end a more aggressive appearance that strengthens the entire design. 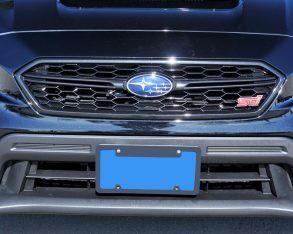 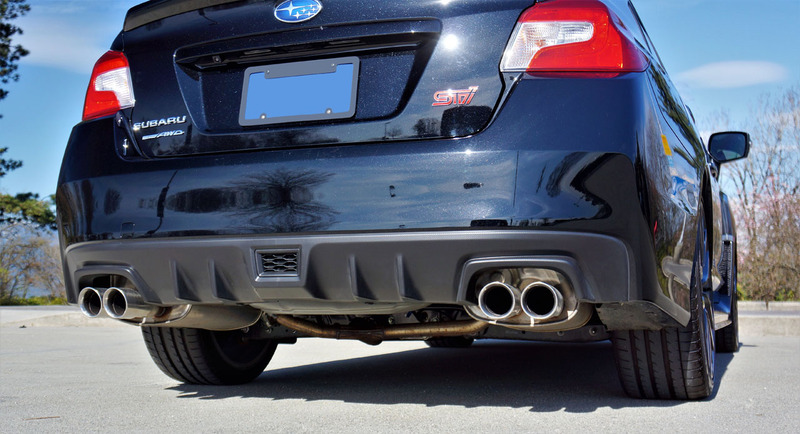 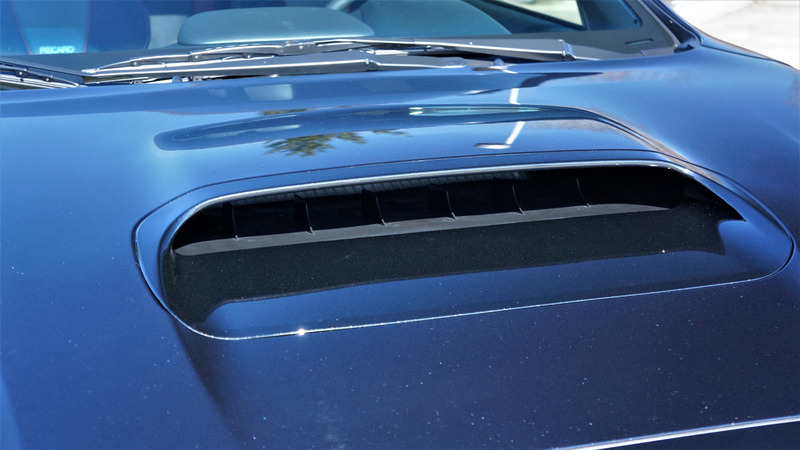 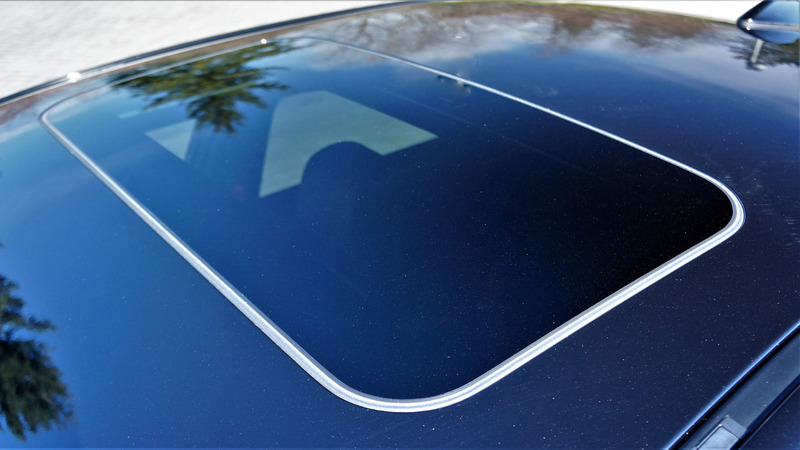 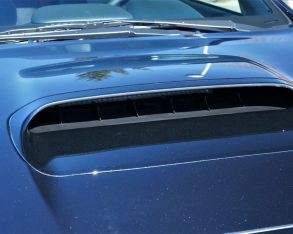 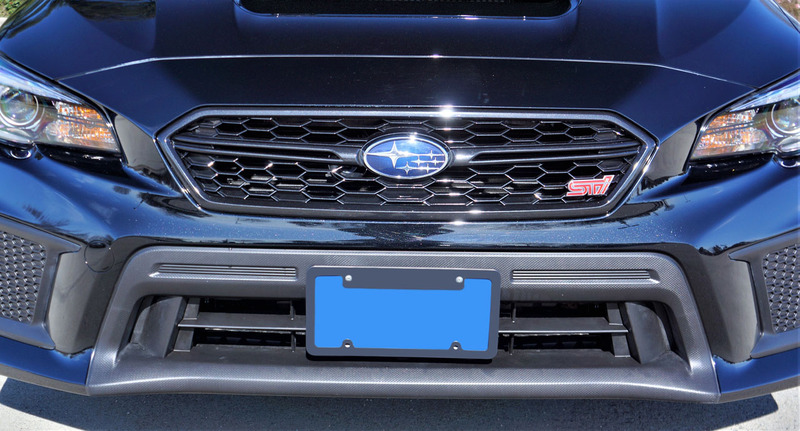 I also lean more toward subtlety than flash, so therefore I was glad Subaru chose the smaller lip spoiler for my ride. 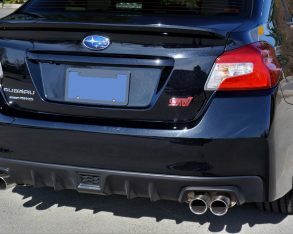 Of course I appreciate the downforce benefits of a gargantuan rear wing when attempting to breach the sound barrier, or at least reach the STI’s top track speed of 251 km/h, but there’s no race course anywhere near my home that would allow for such a test, and it goes without saying that I’d rather not have my car impounded before being forced to pay the towing and storage fees, plus the fines that would be due after being caught doing speed trials on public roads, and then have to explain to Subaru why they couldn’t access their car for a week or more. 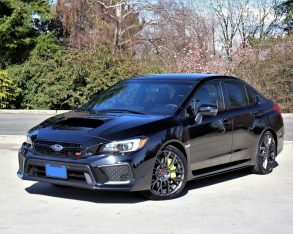 Nah, I’d go for clean lines over radical aero any day of the week, and this upgraded STI looks much more appealing from front to back. 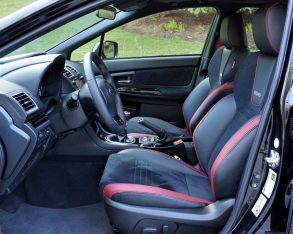 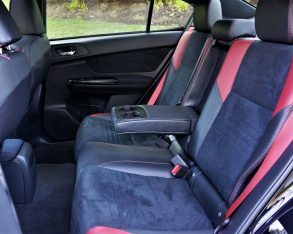 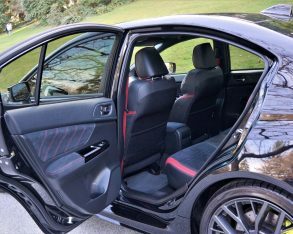 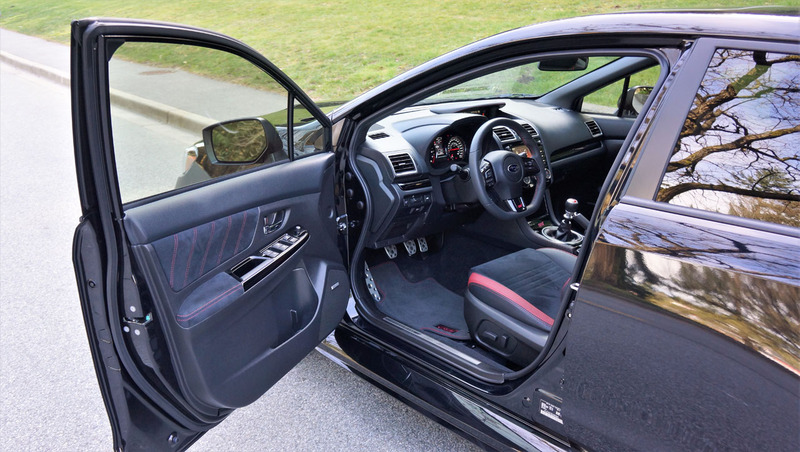 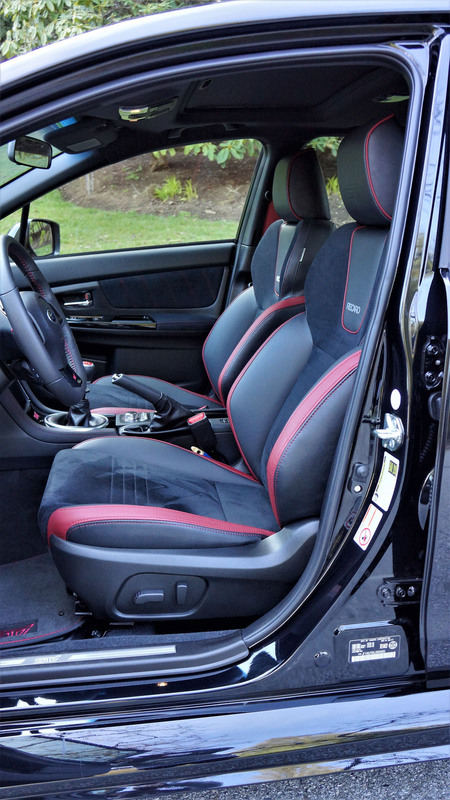 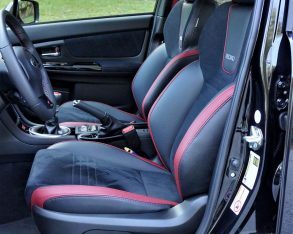 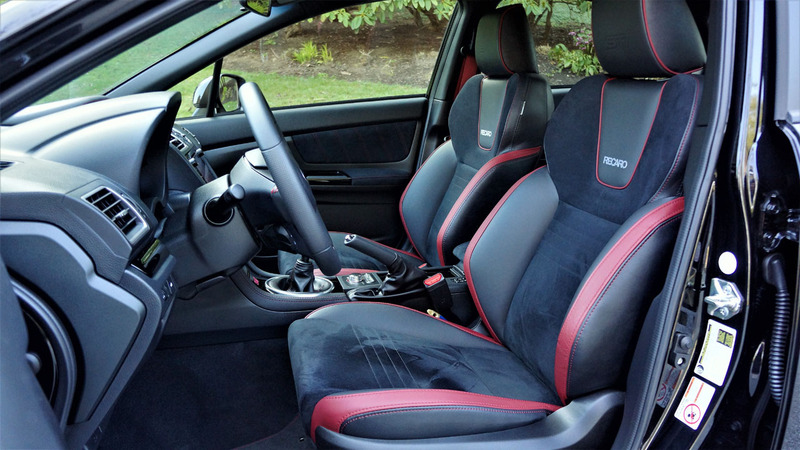 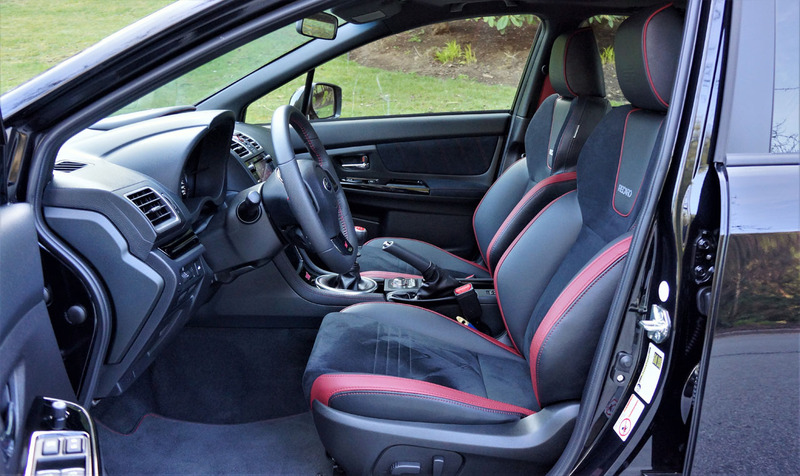 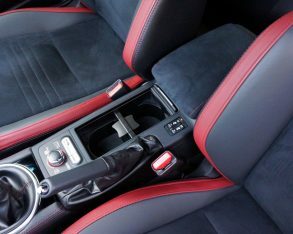 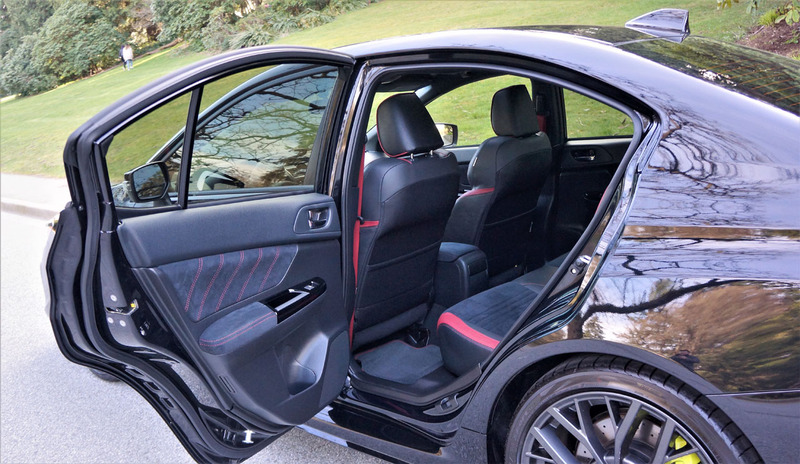 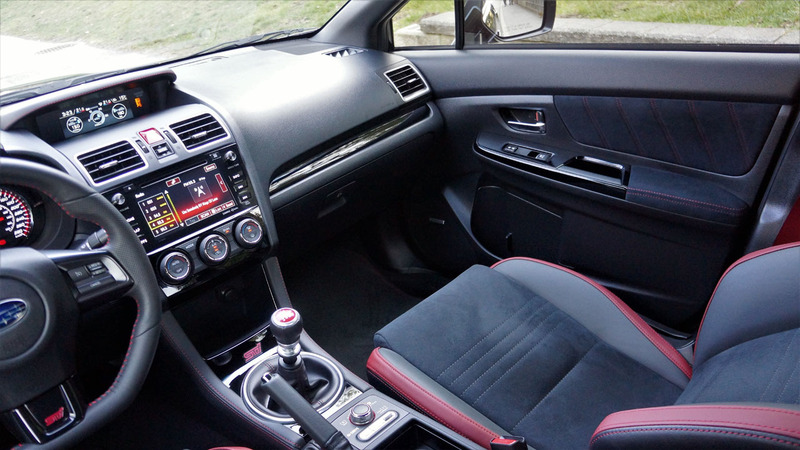 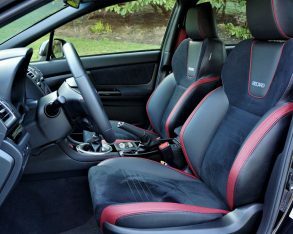 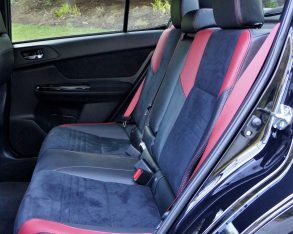 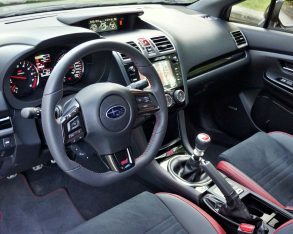 Subaru follows the usual red on black performance car interior theme, and while I won’t go so far to call this approach creative, the overall look is well executed, meaning that it’s not as gauche as some others, such as Honda’s Civic Type-R (that goes for exterior styling too). 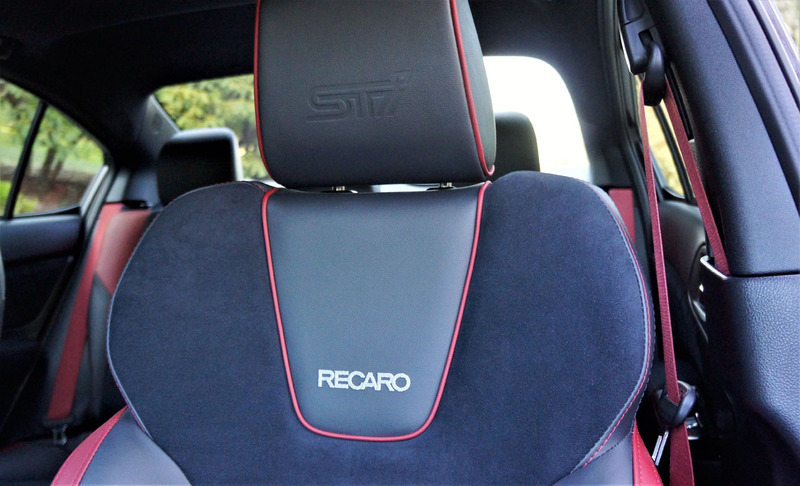 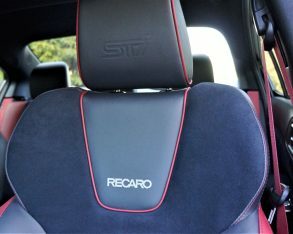 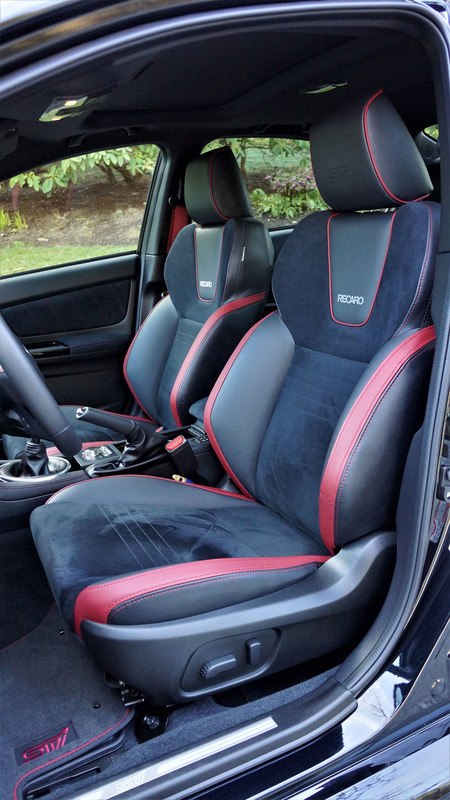 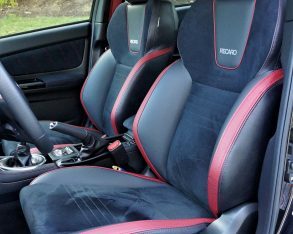 My tester’s Sport-tech trim meant that psuede covered the door panel insets, armrests, and centre seat panels front to back, while the ones up front had the “STI” initials embossed into the leather headrests and white “RECARO” lettering embroidered into the top portion of the seat panel. 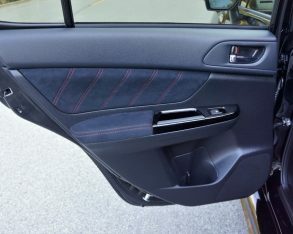 The side bolsters are covered in mostly black leather other than their top portions finished in a thick stripe of red, while the outer sections receive a thin line of red contrast stitching. 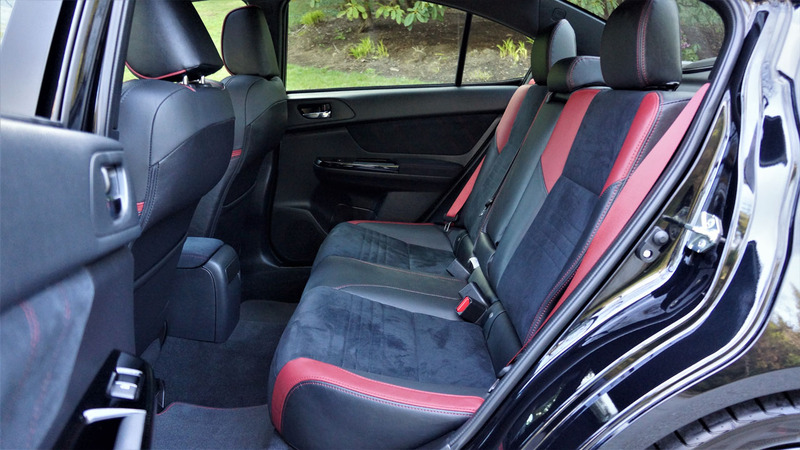 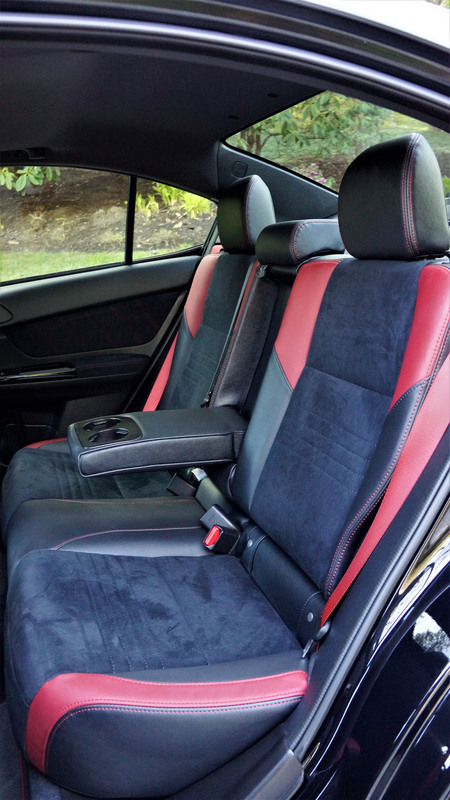 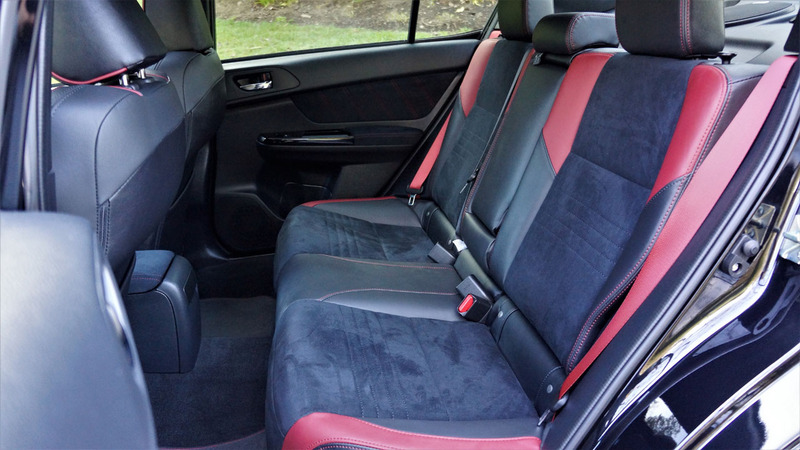 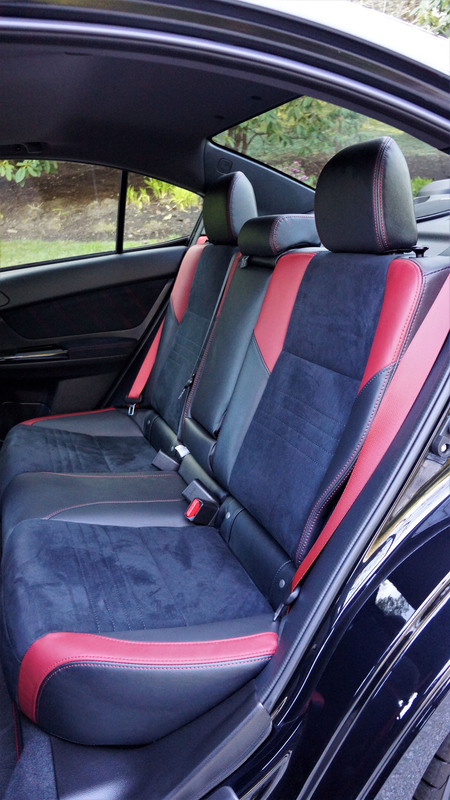 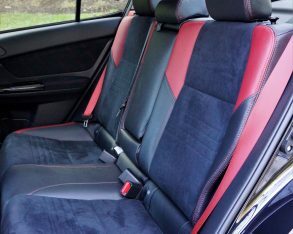 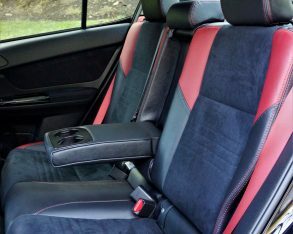 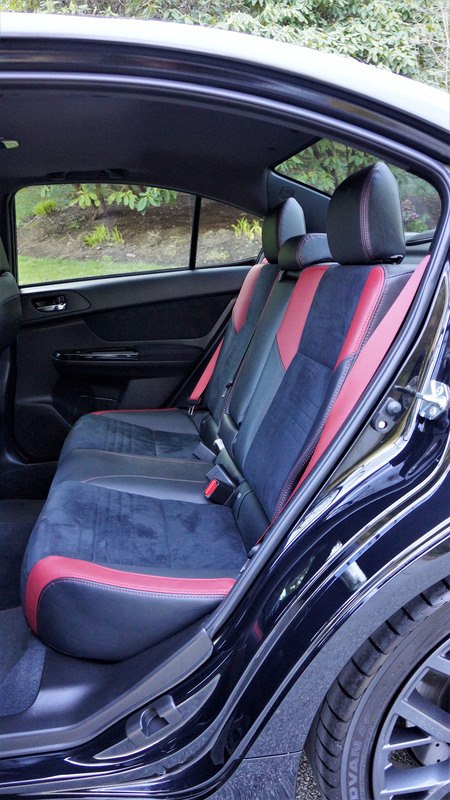 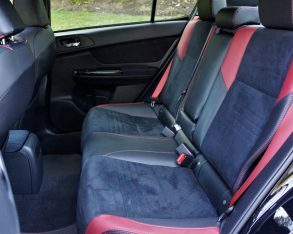 Subaru decorates the seatbacks further with red piping up top, but really what matters most is how wonderfully comfortable and incredibly supportive they are. 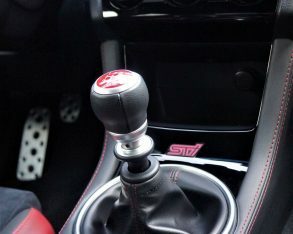 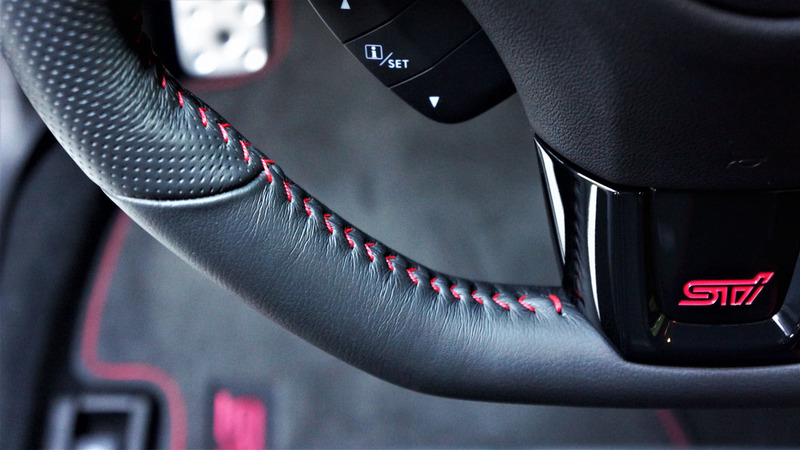 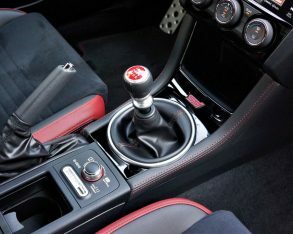 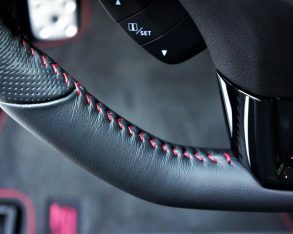 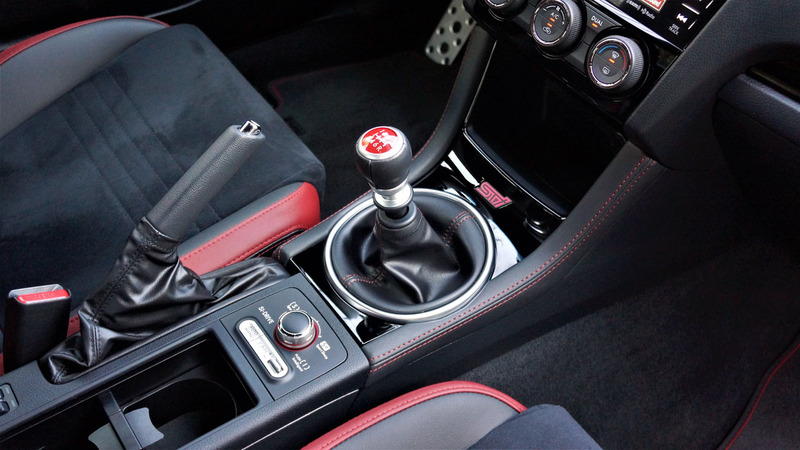 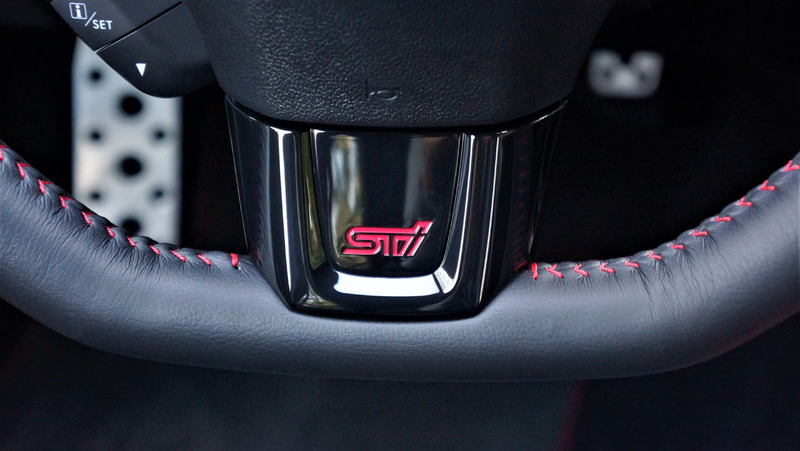 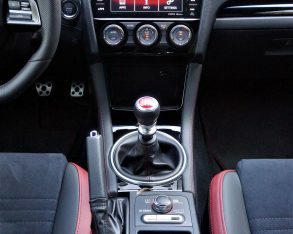 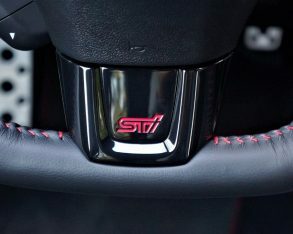 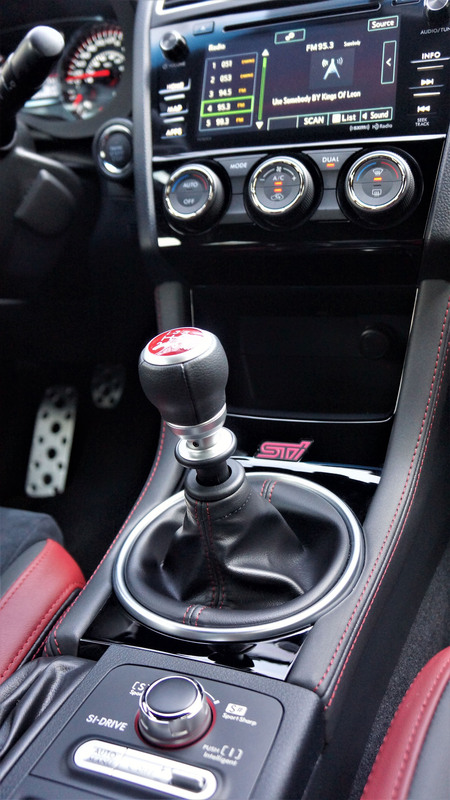 The STI steering wheel is thick, padded, flat-bottomed, leather-wrapped and ideally formed for comfort and, once again, control, with red baseball stitching along the inside of the rim, while the shift knob is black leather as well, with a bright red translucent candy drop top. 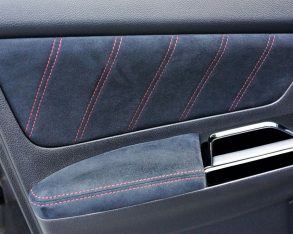 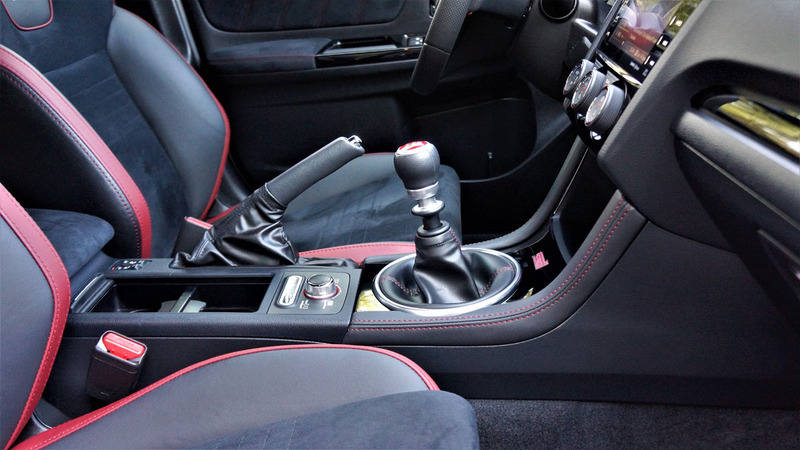 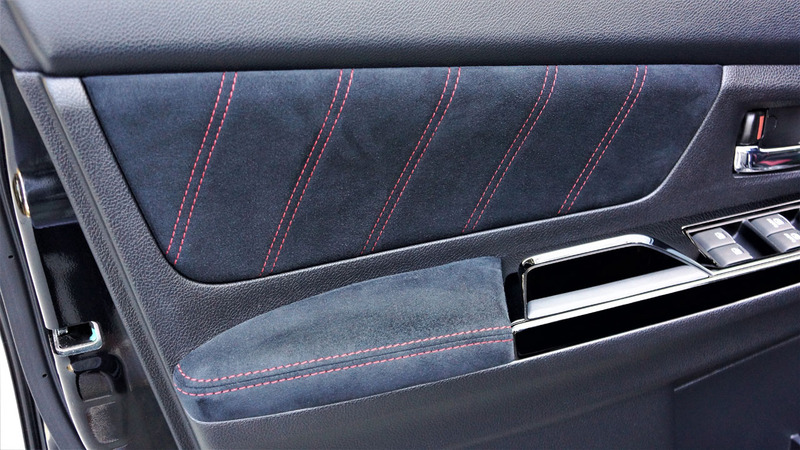 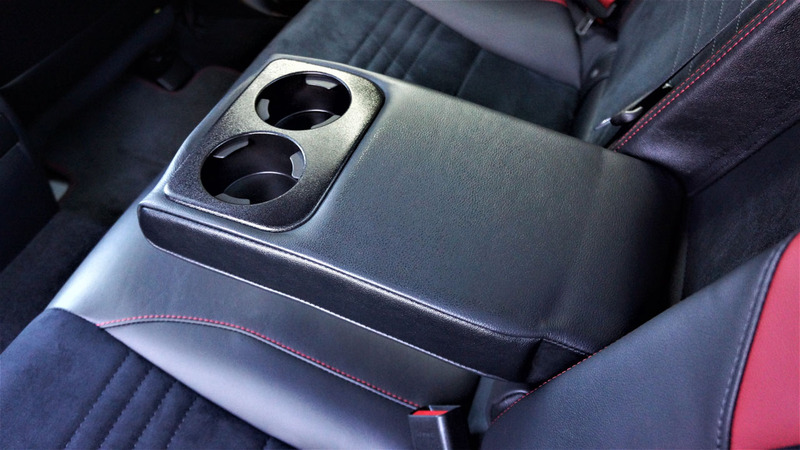 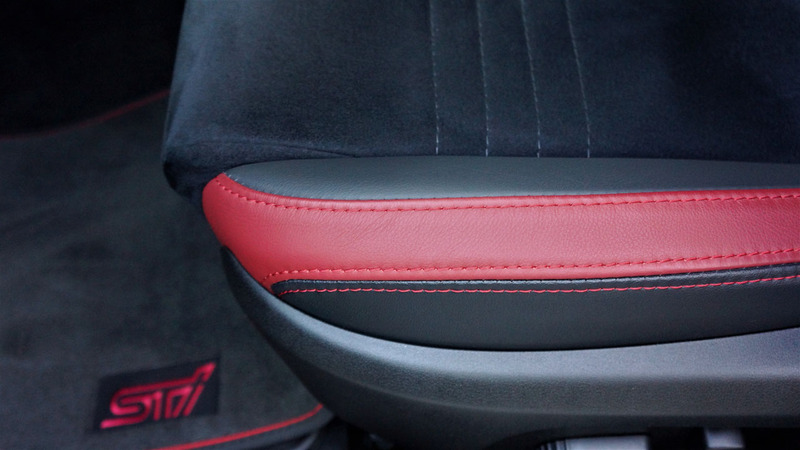 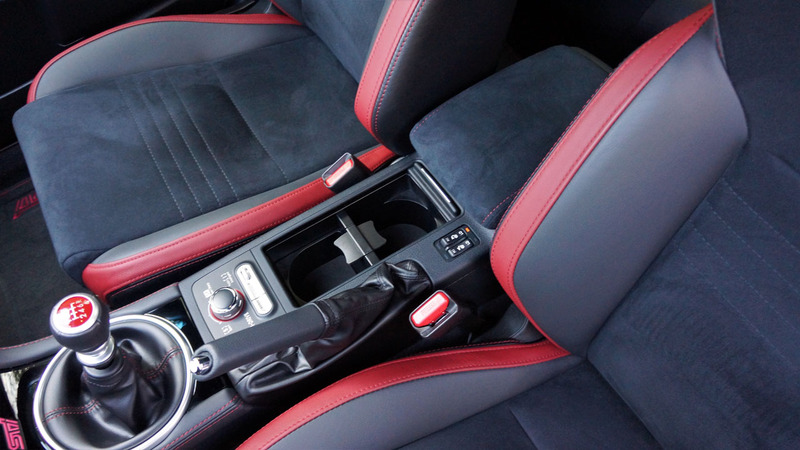 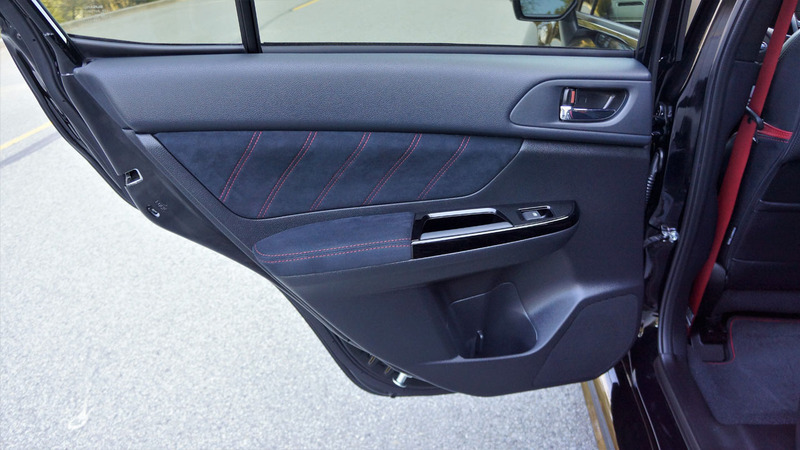 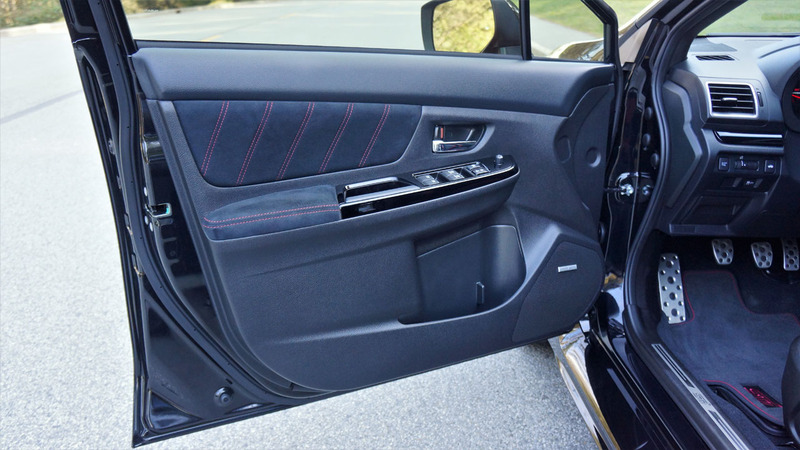 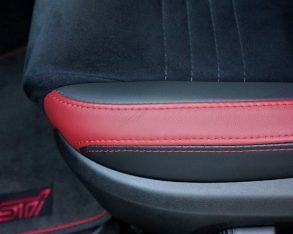 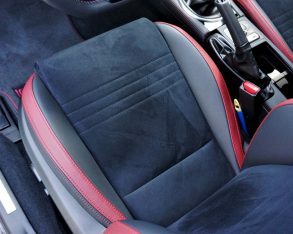 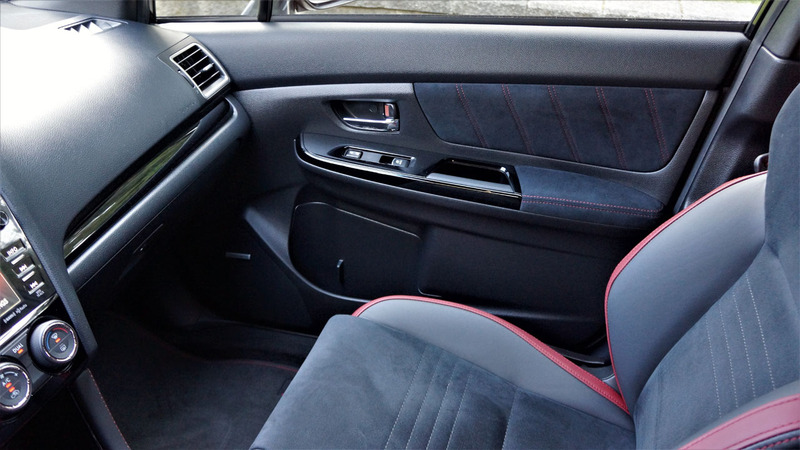 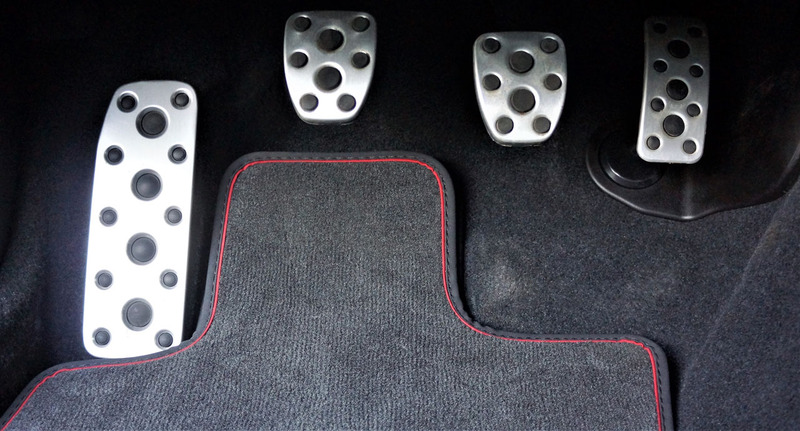 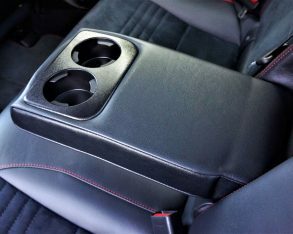 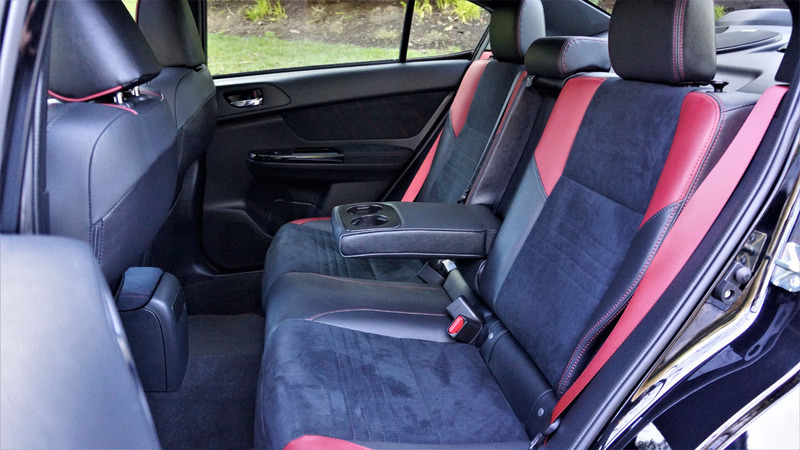 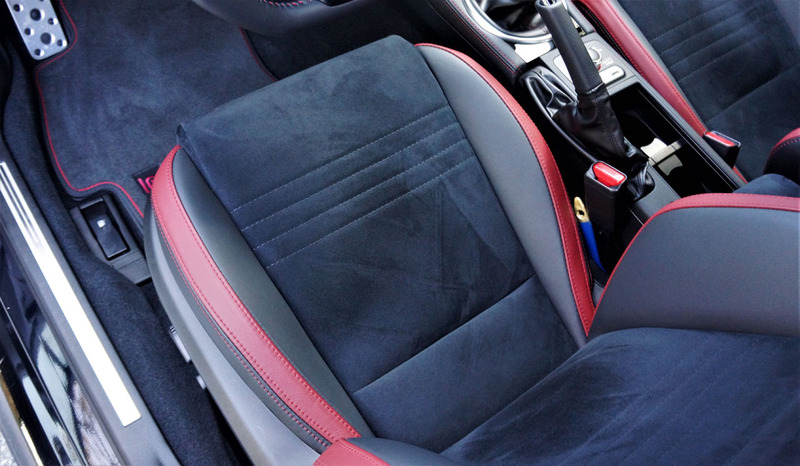 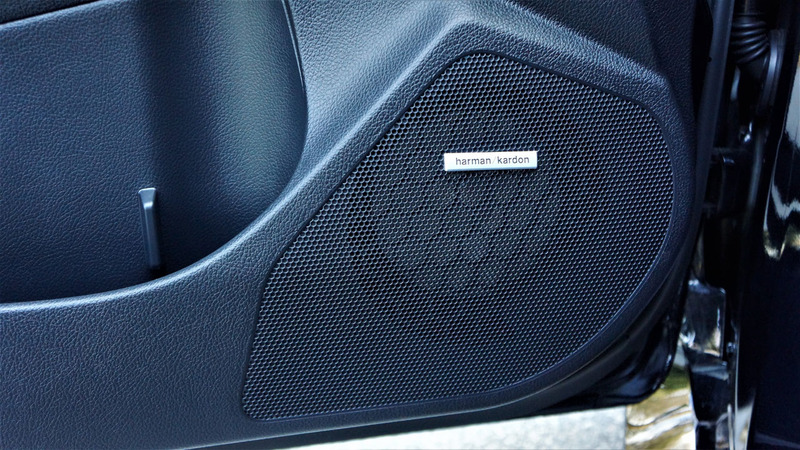 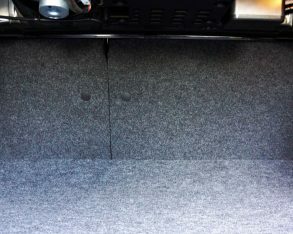 The leather boot below gets red stitching to match the same thread used on both sides of the padded leatherette trimmed centre console, the new STI a lot more luxe than any previous WRX model. 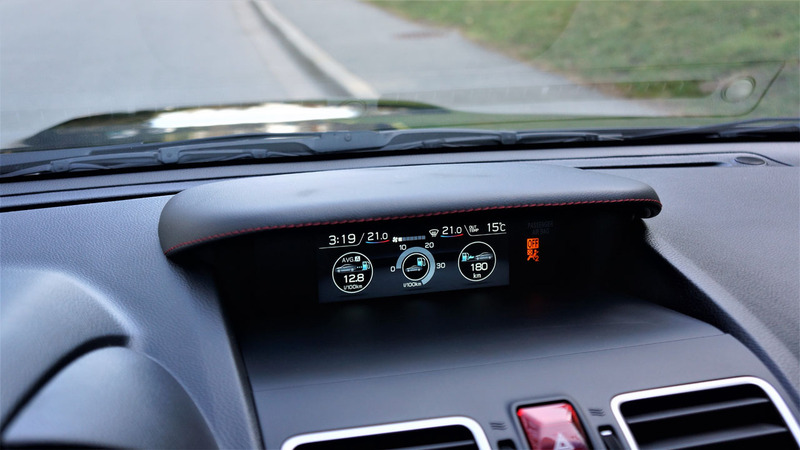 The hood shielding the dash-top MID gets the same red-stitched leatherette treatment, while the fiery colour illuminates the primary gauges, the infotainment interface background and some of the cabin’s switchgear before continuing onto each door panel and elsewhere throughout the interior. 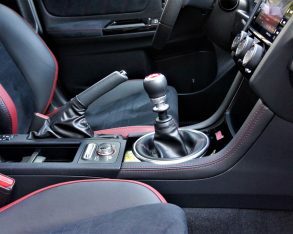 And as overdone as this might sound in words, it’s actually quite tasteful when viewed. 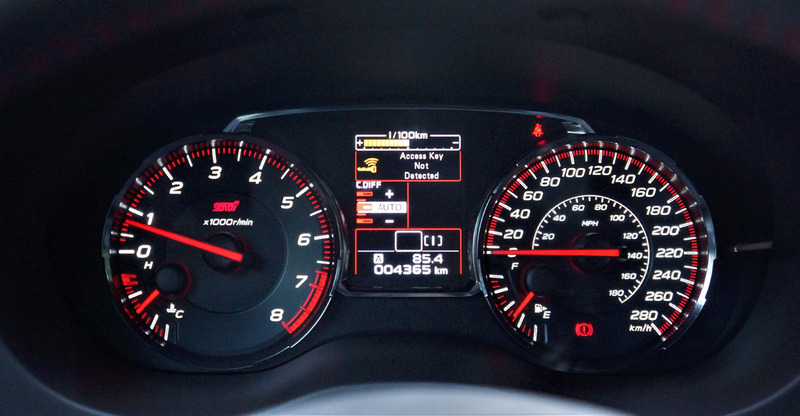 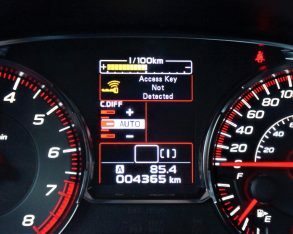 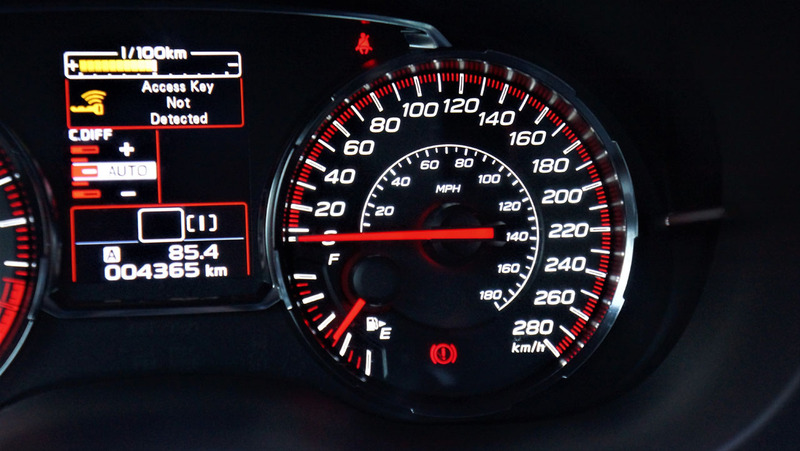 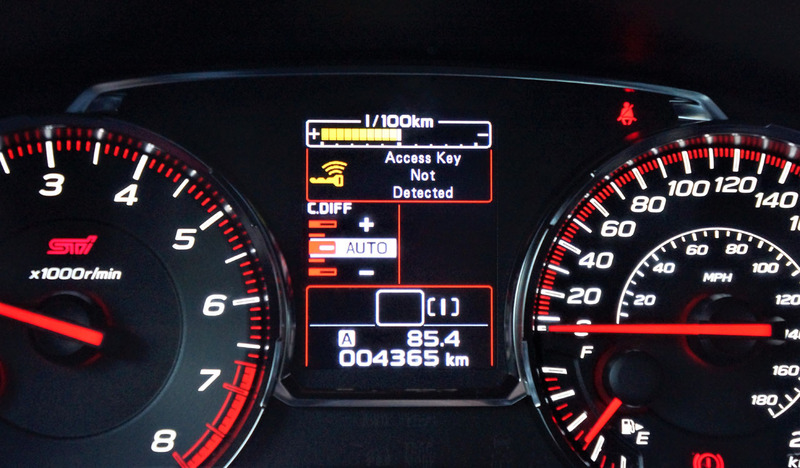 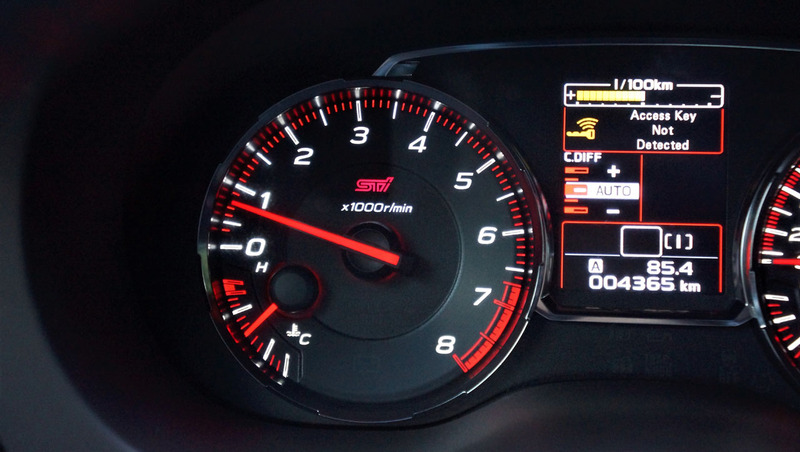 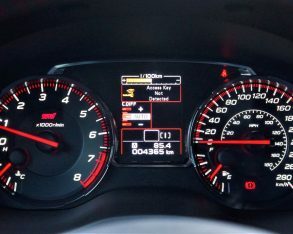 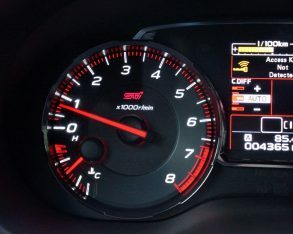 That gauge cluster is 100-percent purposeful performance, with bright, clear dials that are easy to read in any light, while the multi-info display at centre isn’t as graphically stimulating as some others in the segment, yet still displays an eco-gauge, driving time info, a digital speedometer, a gear display, cruise control details, an odometer, trip meter, SI-Drive (Subaru Intelligent Drive) indicators, and something no other brand’s vehicles have, a graphic showing front and real power bias from the aforementioned DCCD system, actuated via a rocker switch on the centre console. 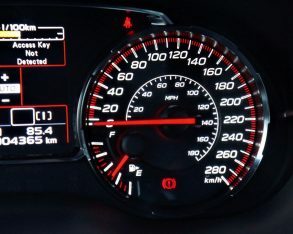 Just in case you’re feeling shortchanged for not getting as much digitized imagery in the gauge cluster display, check out the big dash-top MID mentioned a moment ago. 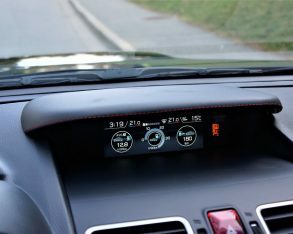 Controlled via a rocker switch just above the infotainment display, it comes filled with a high-resolution TFT screen and loads of functions like average fuel economy, graphics for the configurable centre differential, a digital PSI boost gauge, etcetera, making it a helpful sidekick to the much larger StarLink infotainment touchscreen on the centre stack below, this such a massive improvement over previous WRX systems that it’s a night and day experience. 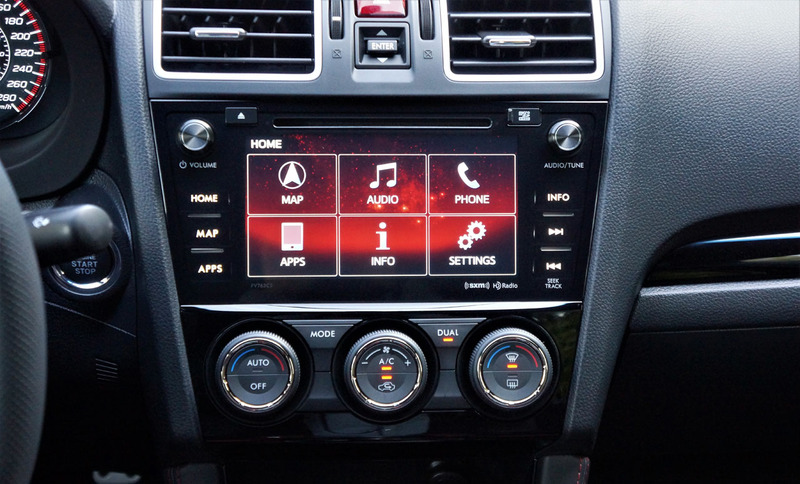 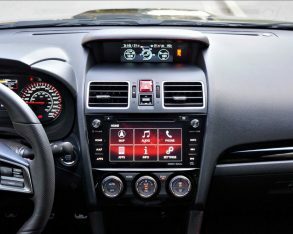 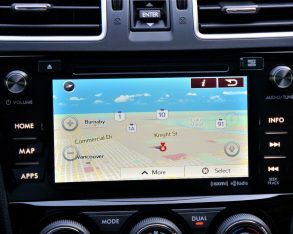 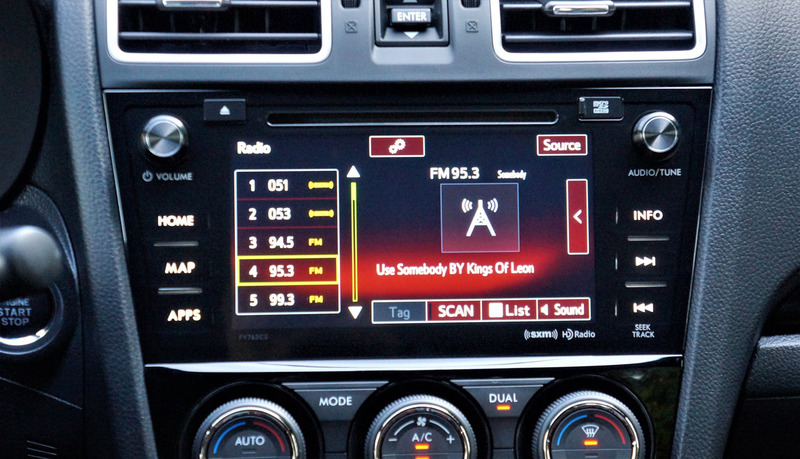 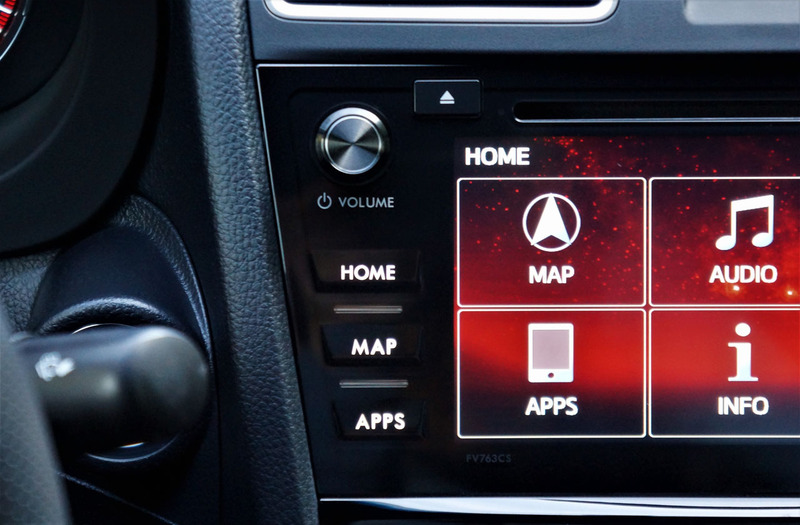 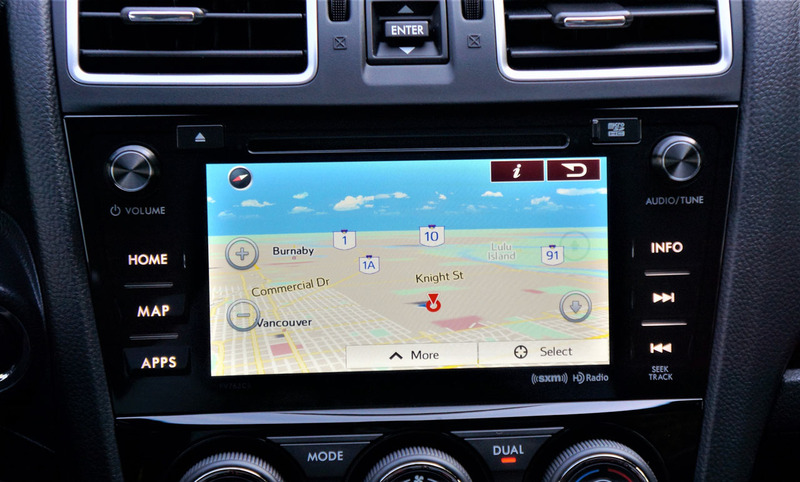 Thanks to its Sport-tech upgrade, my tester’s touchscreen was a half-inch larger at 7.0 inches in diameter, while its ultra high-resolution glossy display also gets navigation with detailed mapping, plus Apple CarPlay and Android Auto, along with all the functionality of the lesser 6.5-inch system, such as a backup camera with guidelines, and all of the aforementioned features and apps. 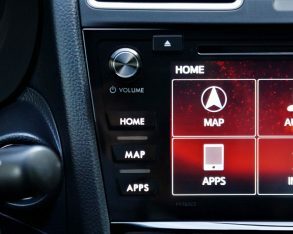 They’re all accessible from an interface with superb graphics and a really nice layout, featuring big digital buttons for the map, audio, phone, apps, info, and settings interfaces. 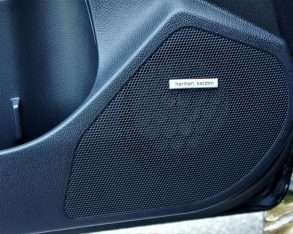 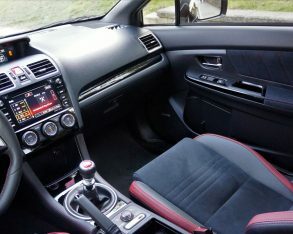 Over and above features already mentioned, $47,295 Sport-tech trim includes proximity keyless access with pushbutton ignition, and a great sounding 320-watt, nine-speaker Harman Kardon audio system, while additional items pulled from $42,495 Sport trim include 245/35R19 89W Yokohama Advan Sport V105 performance rubber to go with those aforementioned uprated rims, welcome lighting, a powered moonroof, the Subaru Rear/Side Vehicle Detection System (SRVD) featuring blindspot detection, lane change assist, and rear cross traffic alert, plus more. 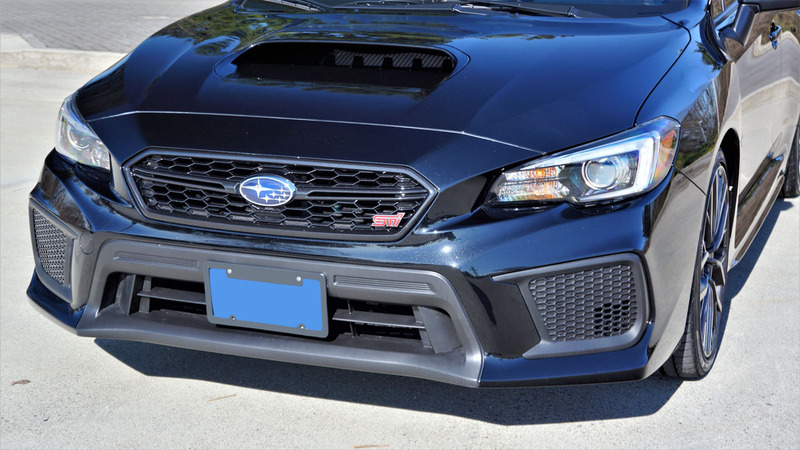 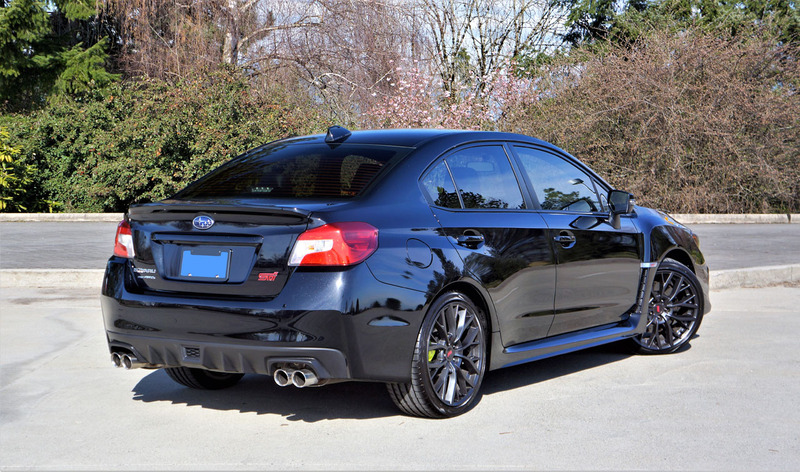 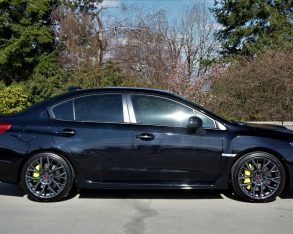 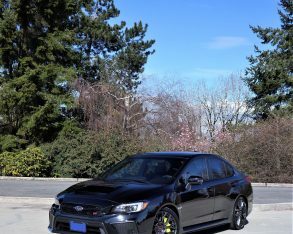 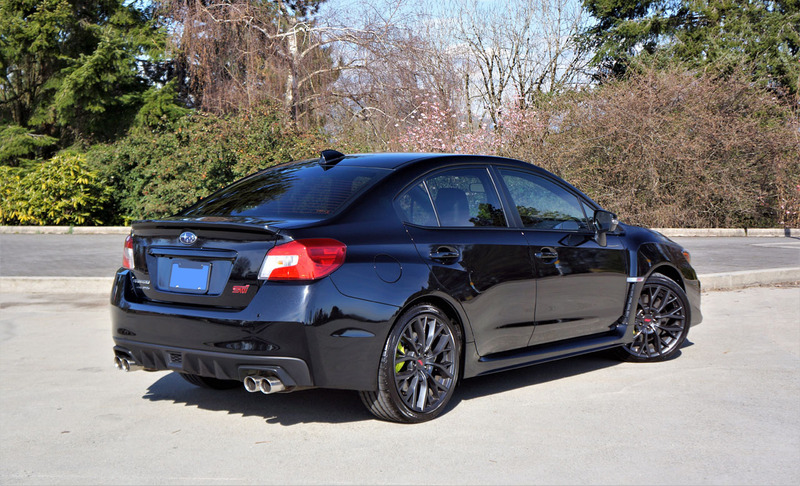 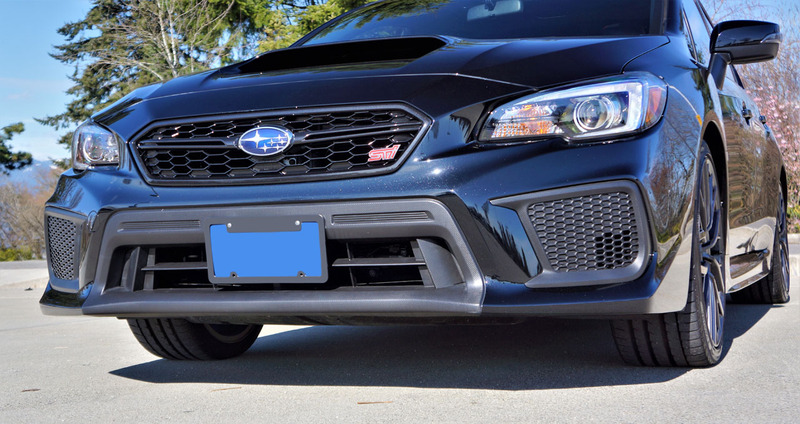 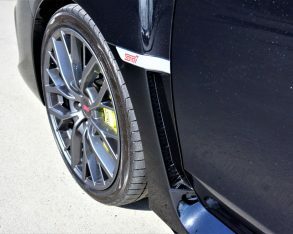 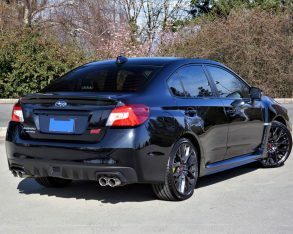 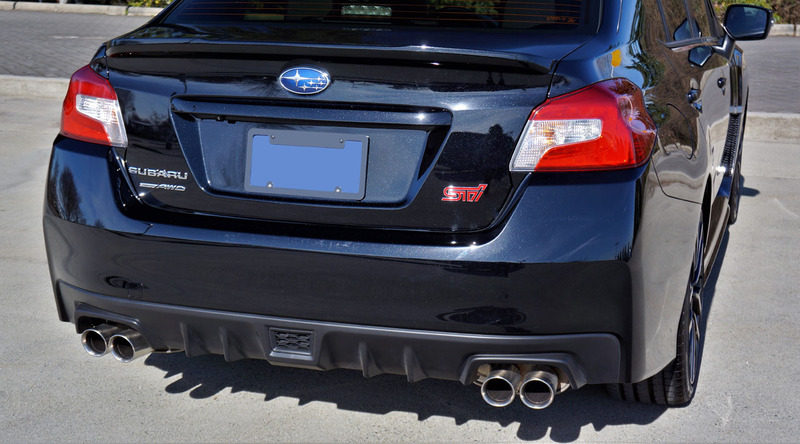 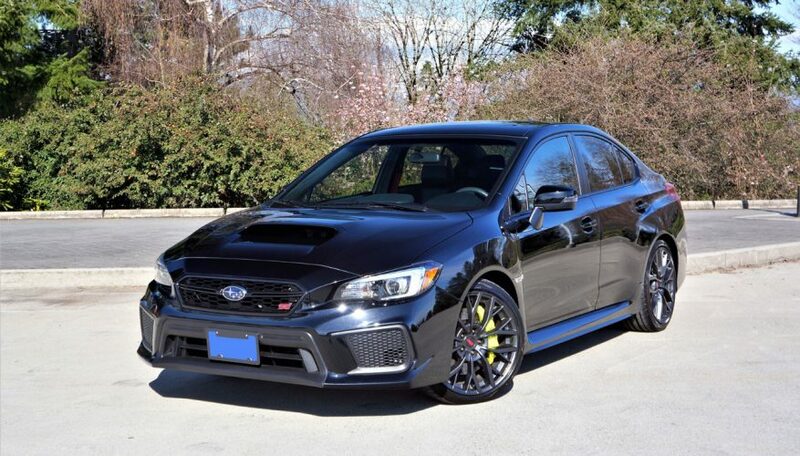 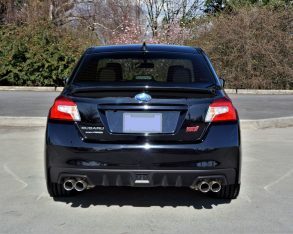 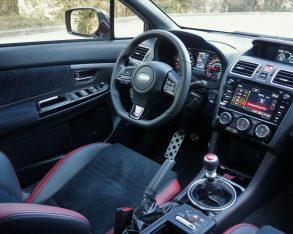 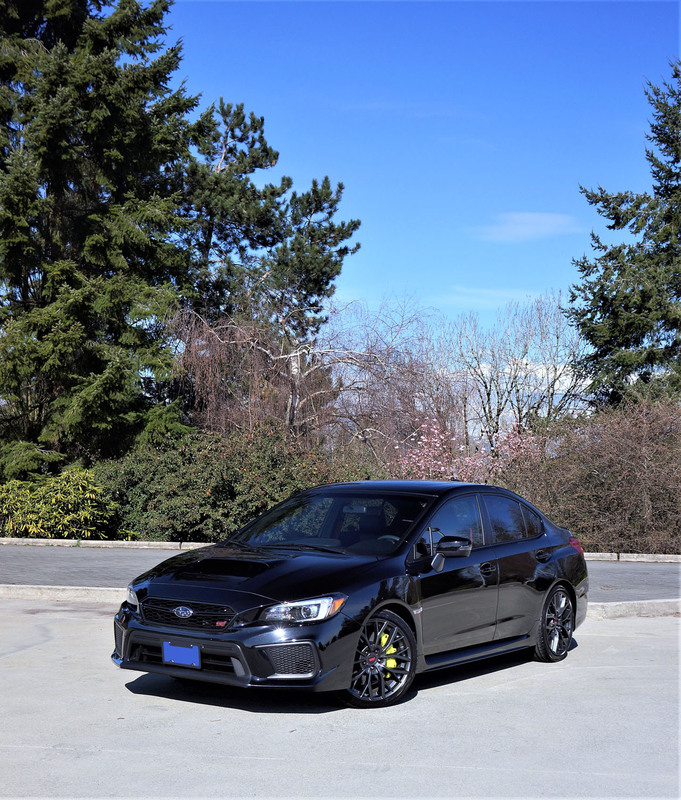 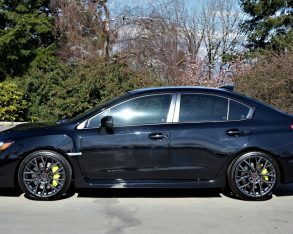 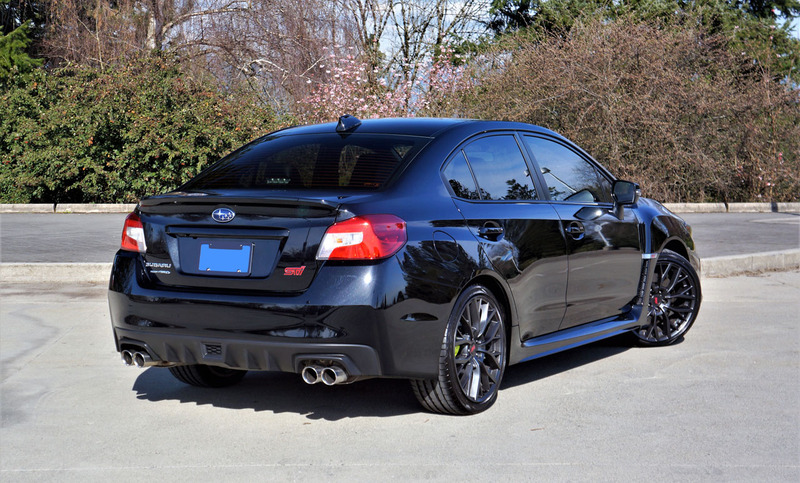 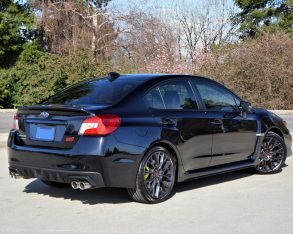 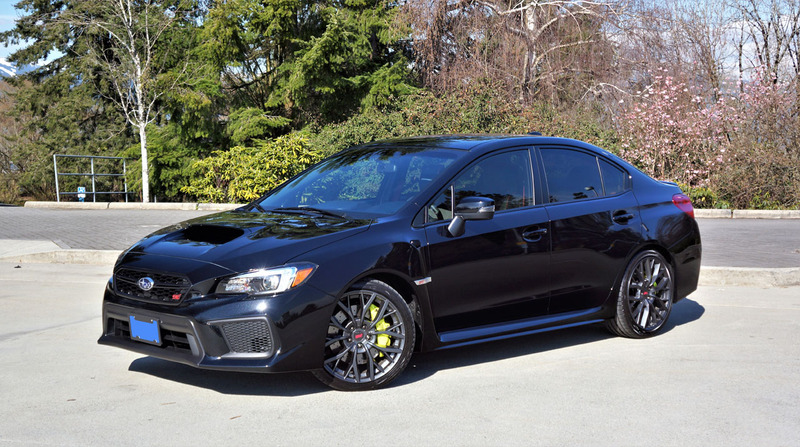 Lastly, on top of features that come standard with the regular $29,995 WRX and other previously noted features, all STI’s include a glossy black grille, brushed aluminum doorsills with STI branding, carpeted floor mats with a red embroidered STI logo, a leather-wrapped handbrake lever, front and rear seats upholstered in black and red leather with black ultrasuede inserts, dual-zone auto climate control, and a bevy of performance upgrades including a quick-ratio rack and pinion steering system, inverted KYB front MacPherson struts with forged aluminum lower suspension arms, performance suspension tuning, high-strength solid rubber engine mounts, a red powder-coated intake manifold, a close ratio six-speed manual gearbox, a Helical-type limited-slip front differential and a Torsen limited-slip rear diff, plus more for $40,195. 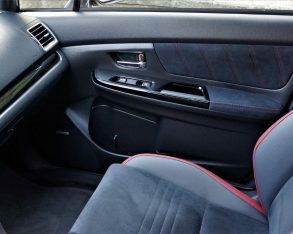 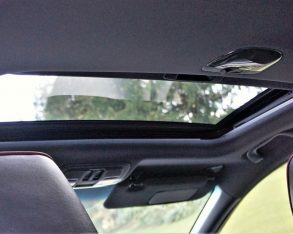 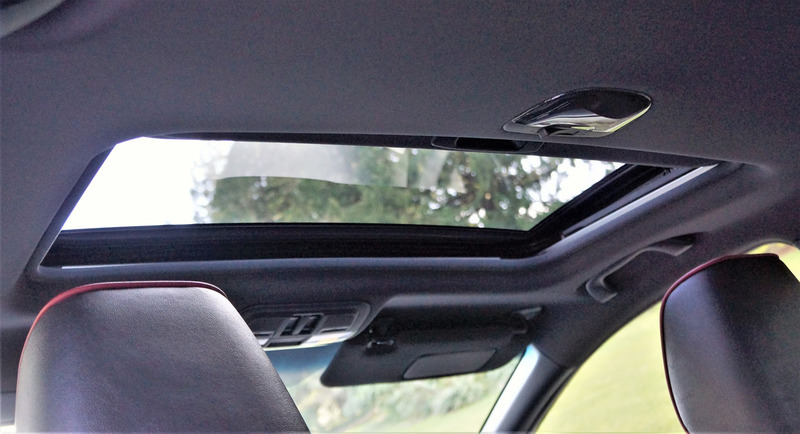 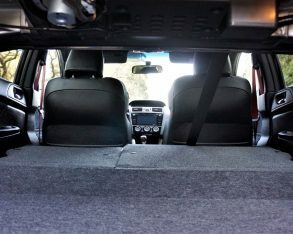 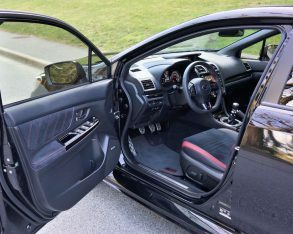 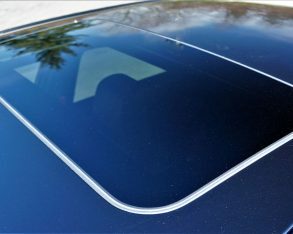 I should also point out that Subaru finishes the interior off with a higher level of soft-touch synthetic surface treatments than ever before, getting the car closer and closer to premium territory with each passing generation. 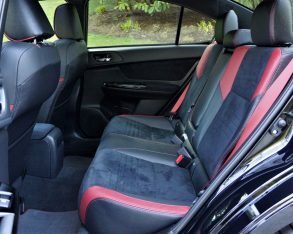 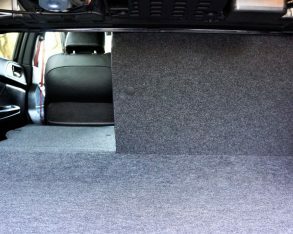 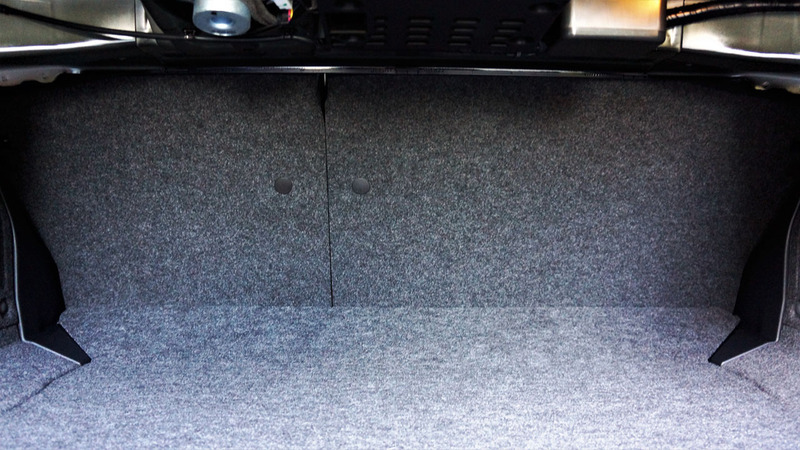 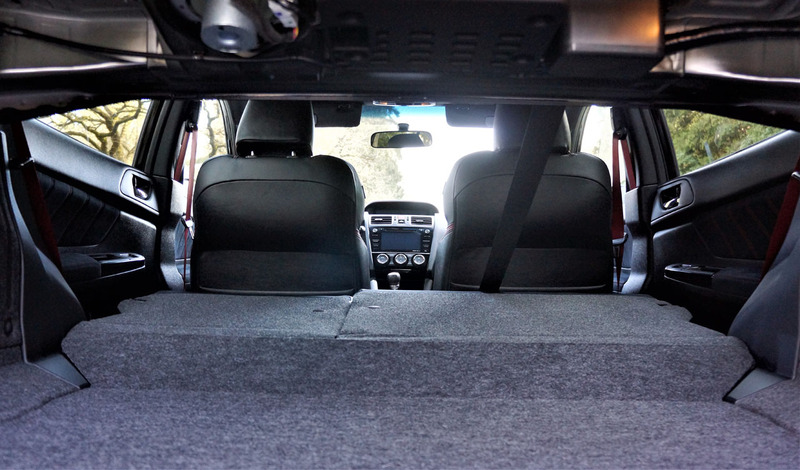 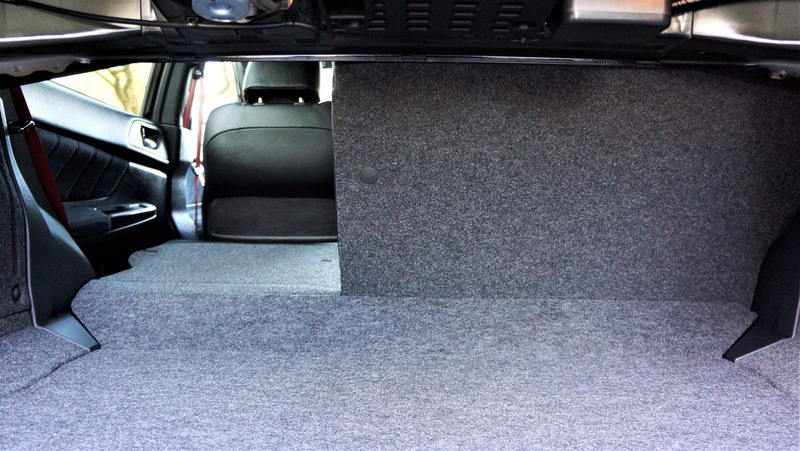 And it’s plenty roomy for a compact too, both up front and in back where the seats are nicely sculpted out to keep your rear passengers in place when pushing the envelope. 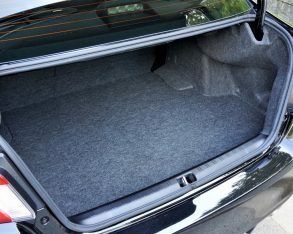 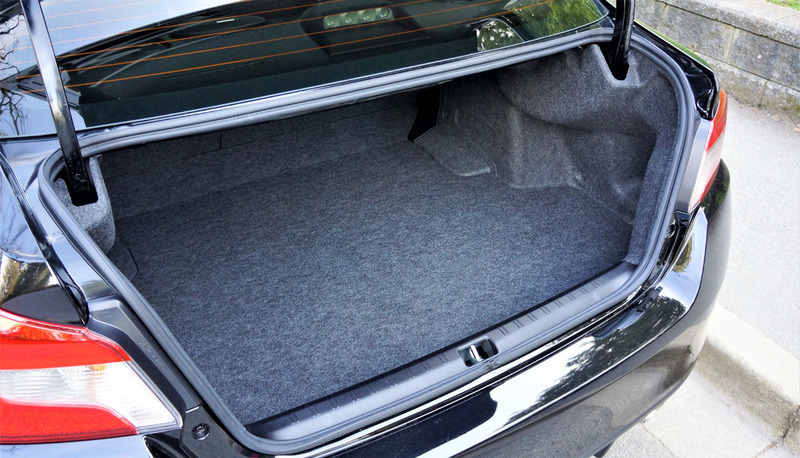 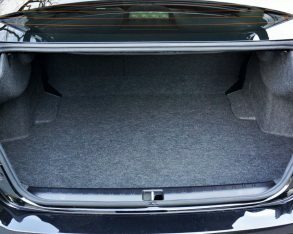 Now that we’re contemplating such practical matters, the STI’s trunk is plenty large for a sports car at 340 litres, and it benefits from expansion for longer items via 60/40-split rear seatbacks. 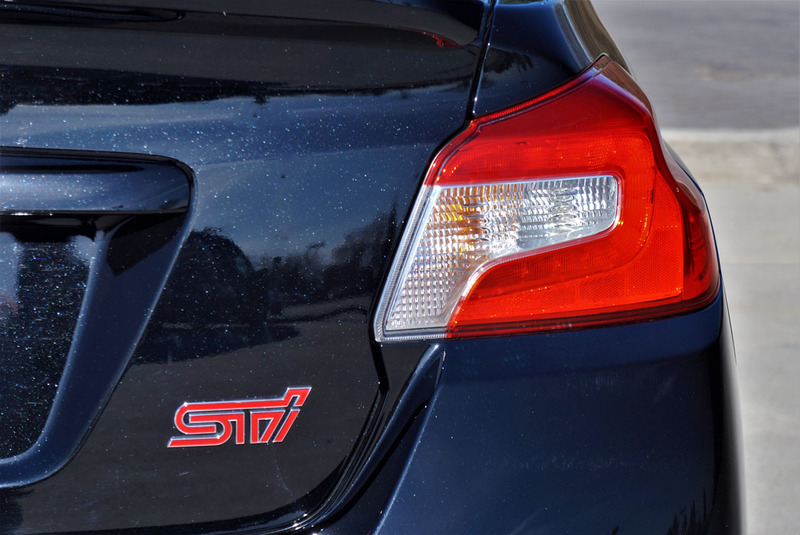 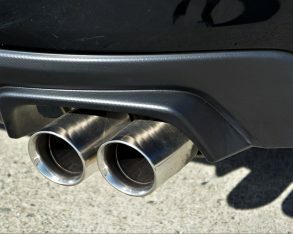 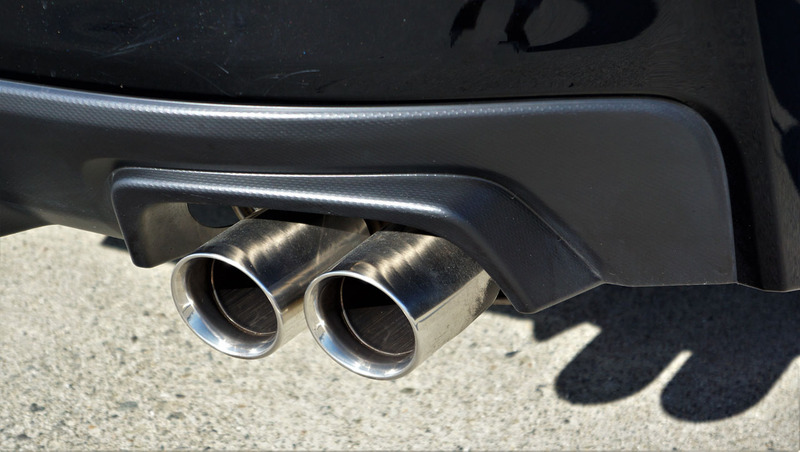 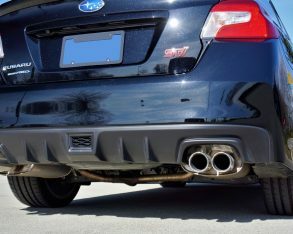 Along that vein, the fact that you’re driving a turbocharged four-cylinder powered compact car won’t benefit your pocketbook all that much in the STI, thanks to 14.1 L/100km city, 10.5 highway and 12.5 combined. 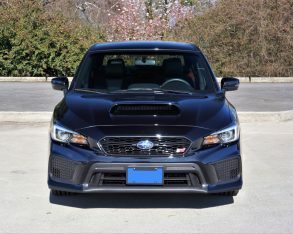 If that’s an issue for you the regular WRX is good for a claimed 11.3 city, 8.5 highway and 10.0 combined, while the same model with its CVT can eke out 12.6, 9.6 and 11.2 respectively. 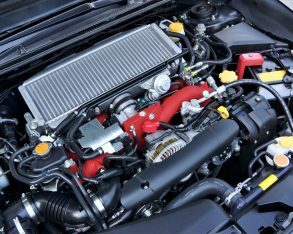 This is where the STI’s 2.5-litre EJ257 H4 comes in, an engine that hasn’t changed one iota since before this car’s full redesign. 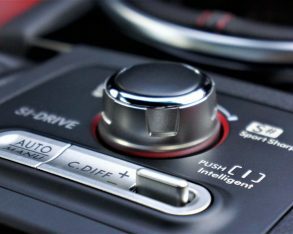 Therefore its output remains 305 horsepower and 290 lb-ft of torque, while its six-speed gearbox is truly smoother to operate since its multiple refinements. 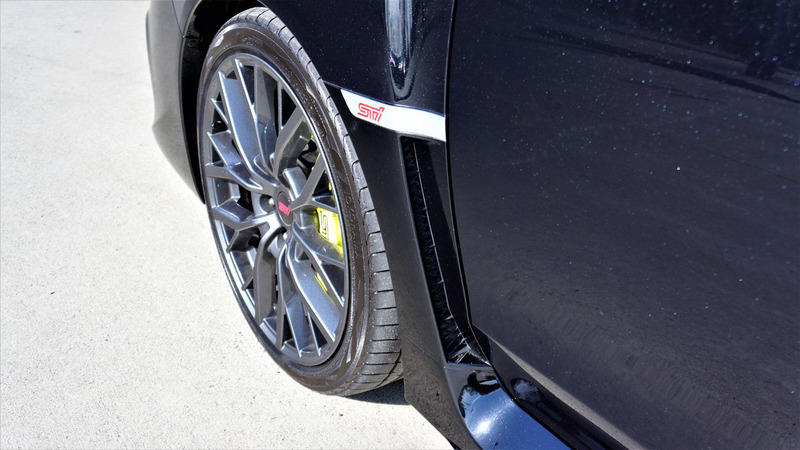 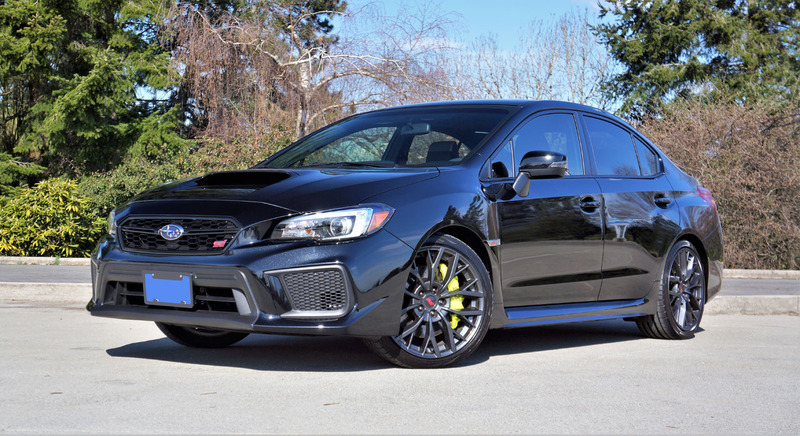 Lastly, the WRX STI’s torque-vectoring Symmetrical-AWD system is still amongst the best in the business, designed for all surface traction, meaning it can easily manage wet or dry pavement, snow, gravel, dirt, or almost anything else you throw in its way. 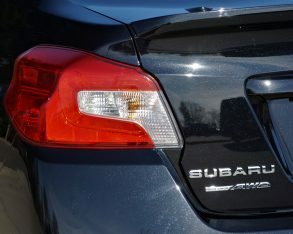 If you’re lucky enough to live near a racetrack or have a friend that owns hectares of ranchland interconnected with drivable dirt roads, or even if there’s a large parking lot (preferably covered in snow) somewhere nearby, Subaru has your ride, and despite all of the sport compacts that have come and gone since the WRX started wooing us from afar way back in the early ‘90s and finally got real for us here in North America in 2002, or 2004 for the STI, it’s still the all-wheel drive compact to beat. 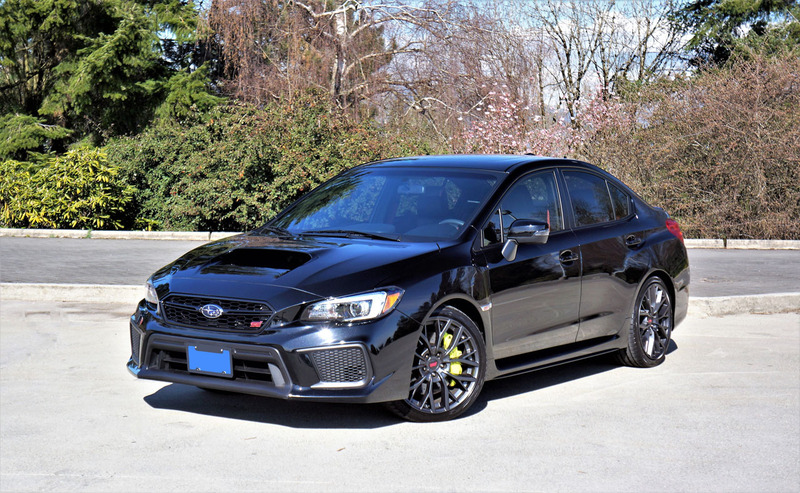 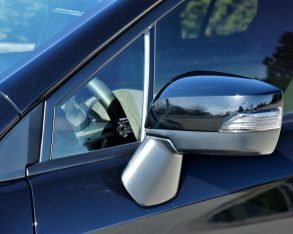 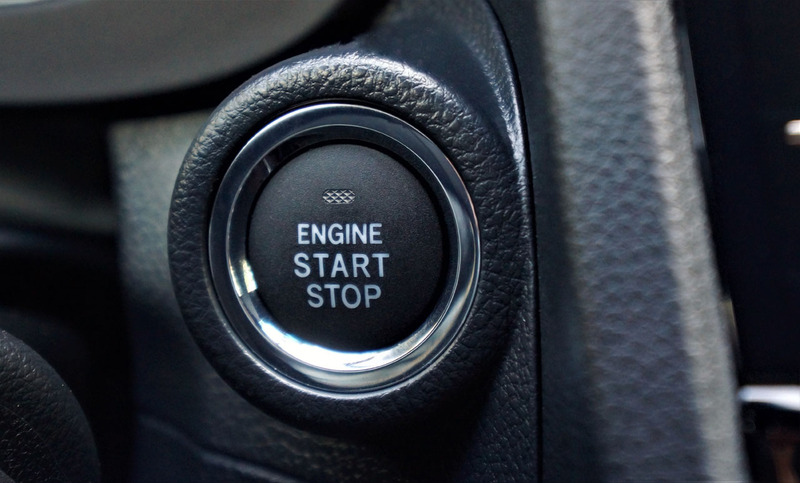 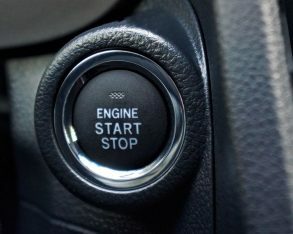 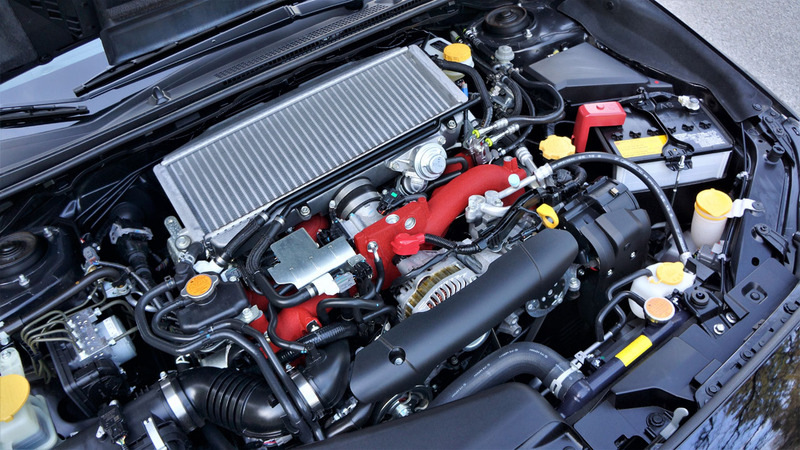 As I write this review the model year changeover from 2018 to 2019 has occurred, which now gives you an option that might be worth your undivided attention. 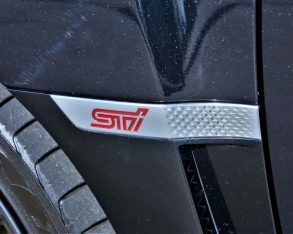 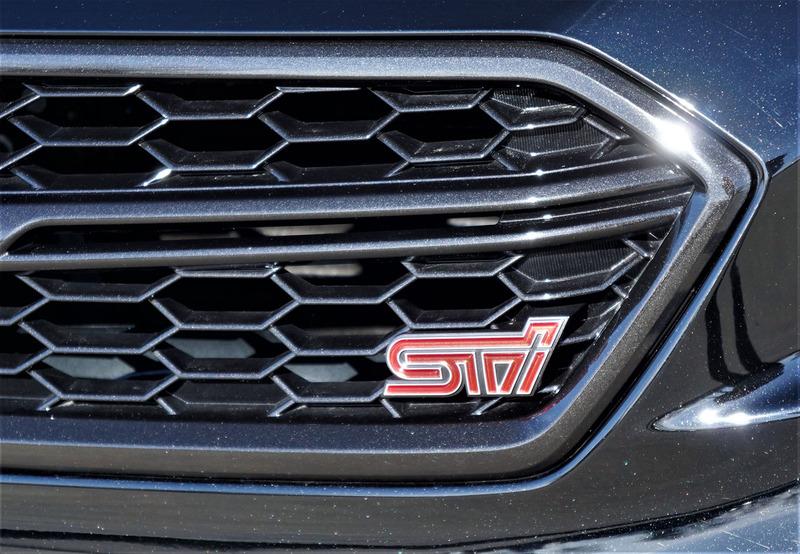 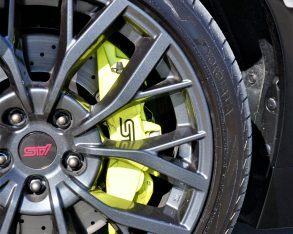 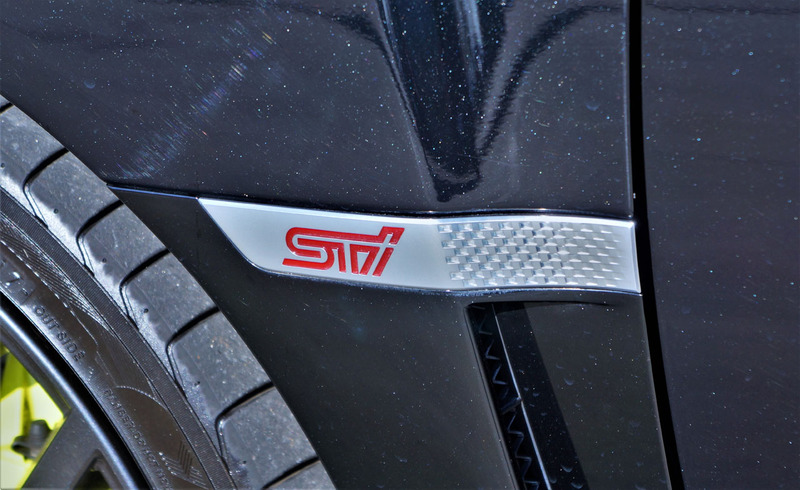 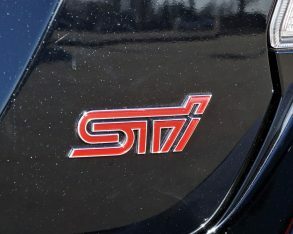 A near identical version of the STI’s turbocharged 2.5-litre four now includes stronger pistons, a new air intake, new ECU programming and a high-flow exhaust system, resulting in the same torque yet five more horsepower totaling 310, while the gearbox gets a new third gear for quicker acceleration. 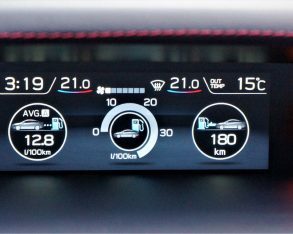 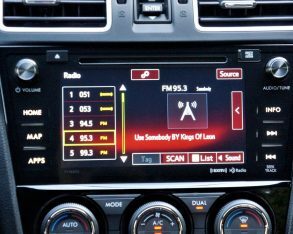 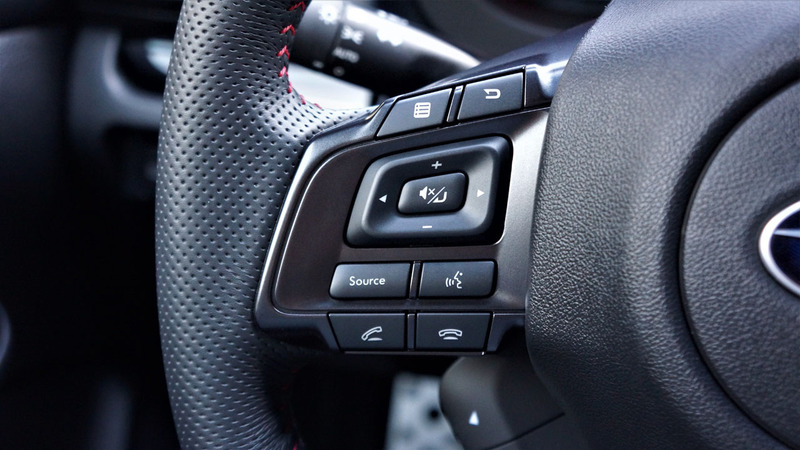 Lastly, the entry and top-line infotainment systems get some tweaks, but like the new powertrain I’ll need to experience these firsthand before making comment. 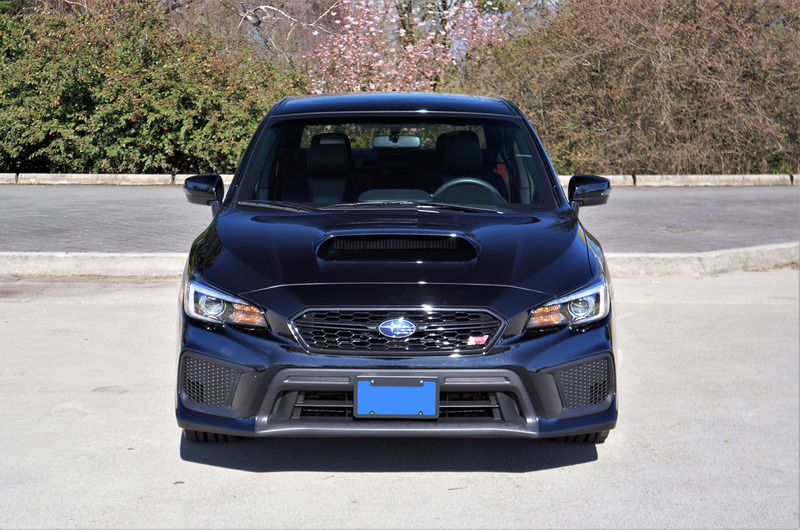 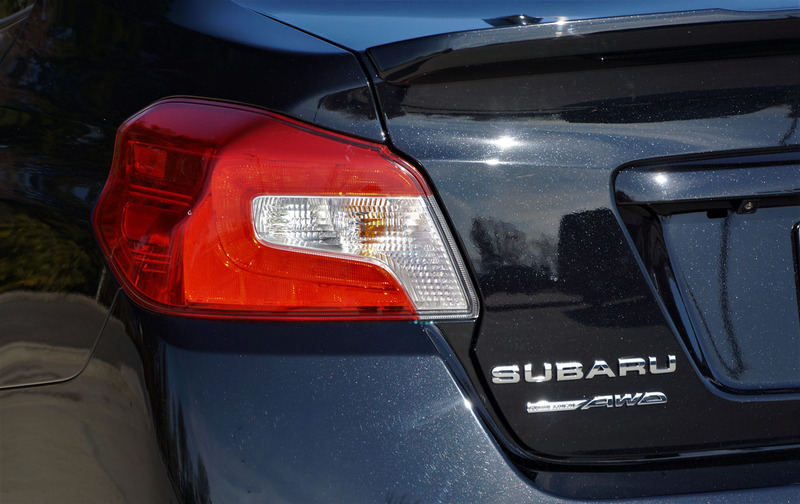 Yes, if you’re longing for an outrageously competent sports car with the added convenience of four doors and a sizeable trunk, look no further than the Subaru WRX STI. 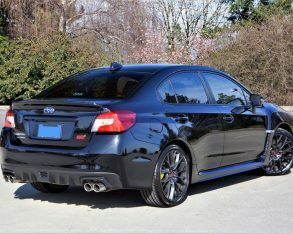 Even if you don’t need the back seat and storage, it’s one of the better performance cars available for less than $50k, and thanks to its ever-improving refinements its now a viable alternative for anyone otherwise interested in a premium-branded sport sedan.